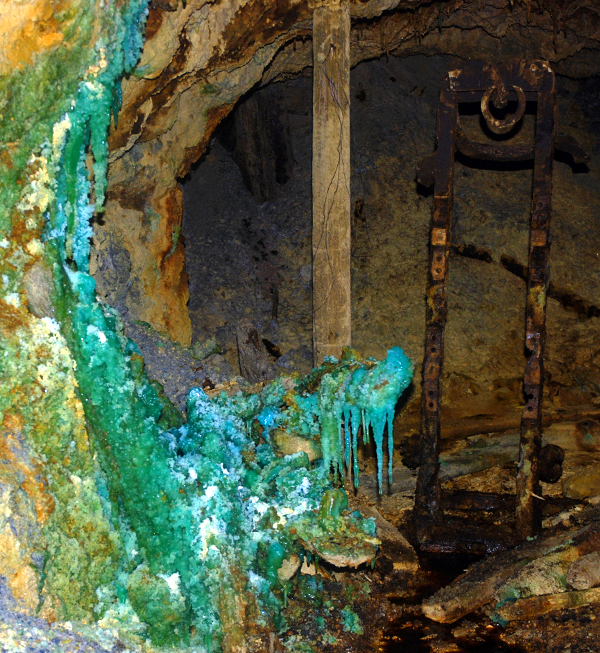 Breiner Mine is located in the valley above the village. 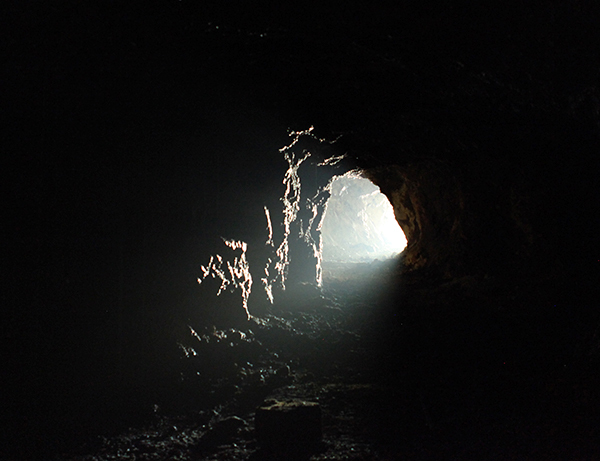 There are two levels accessible and the two entrances are located close to each other. 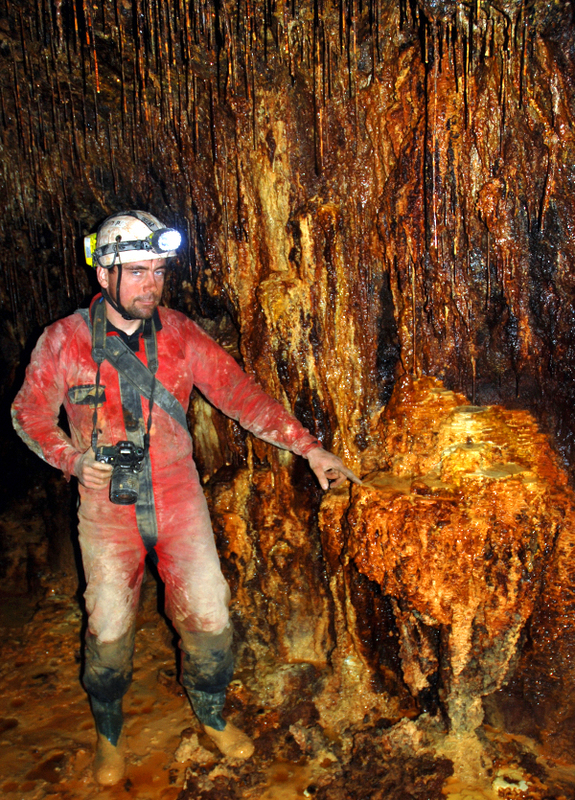 Both levels are quite big, wet and with very interesting secondary minerals. 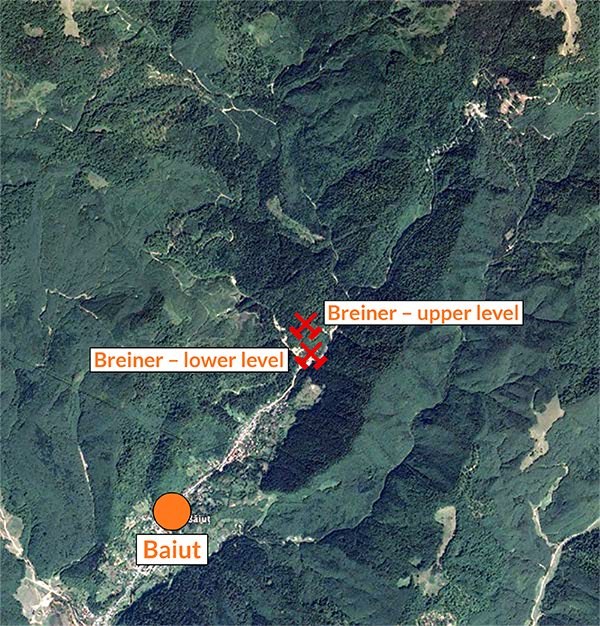 Location of the adits to both Bariner Mine levels. 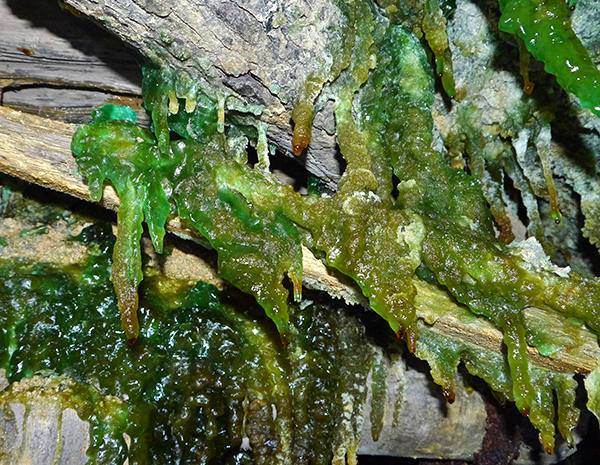 Lower level is very wet in some parts, inaccessible during wet periods. 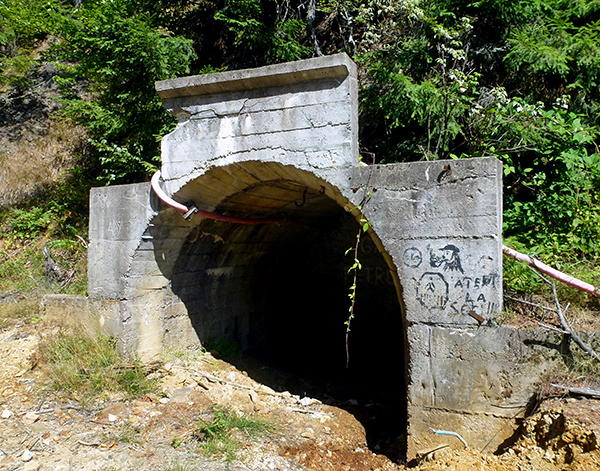 It is rather safe as it was abandoned relatively recently. 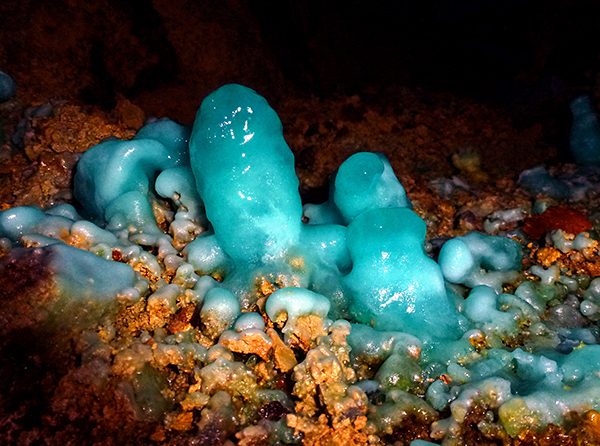 Lower level is where one of the most spectacular secondary minerals form – giant stalagmites of the blue/green melanterite. 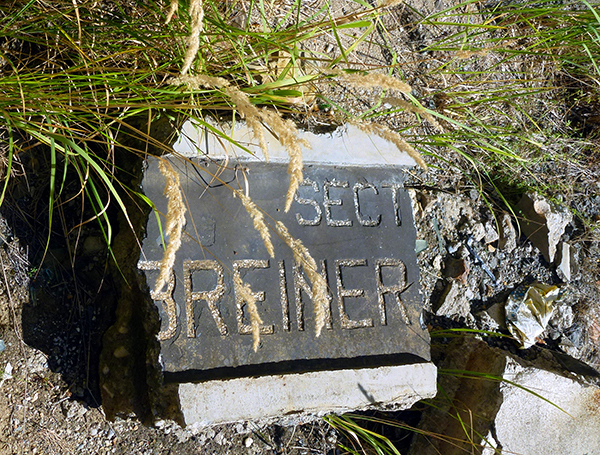 Remains of the sign "Sector Breiner". 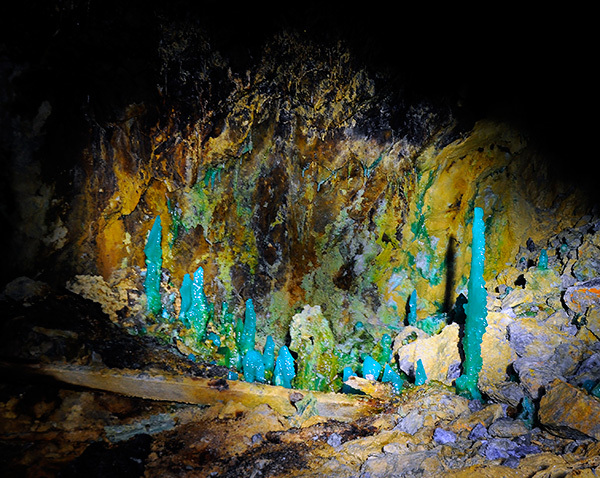 S. Krupa photo. 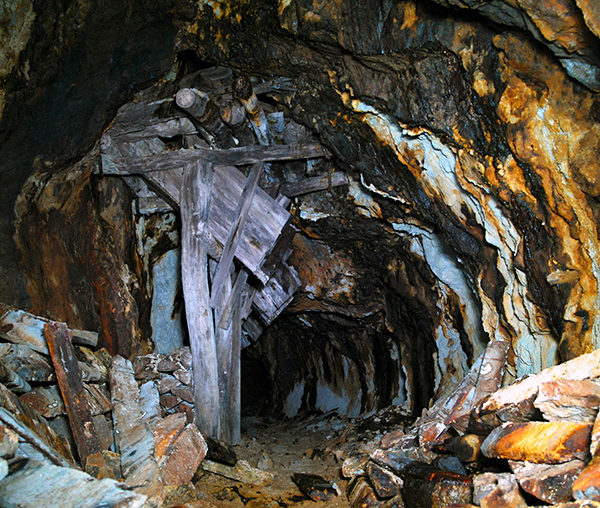 Adit to the lower level of Breiner Mine. P. Żochowski photo. 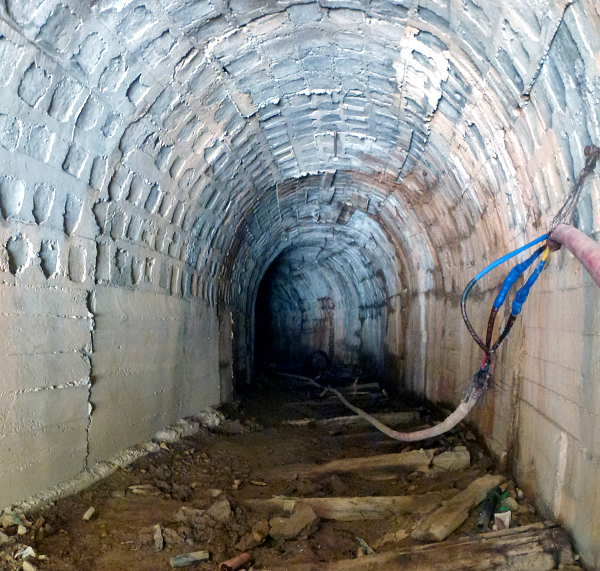 Concrete adit to the lower level of Breiner Mine. P. Żochowski photo. 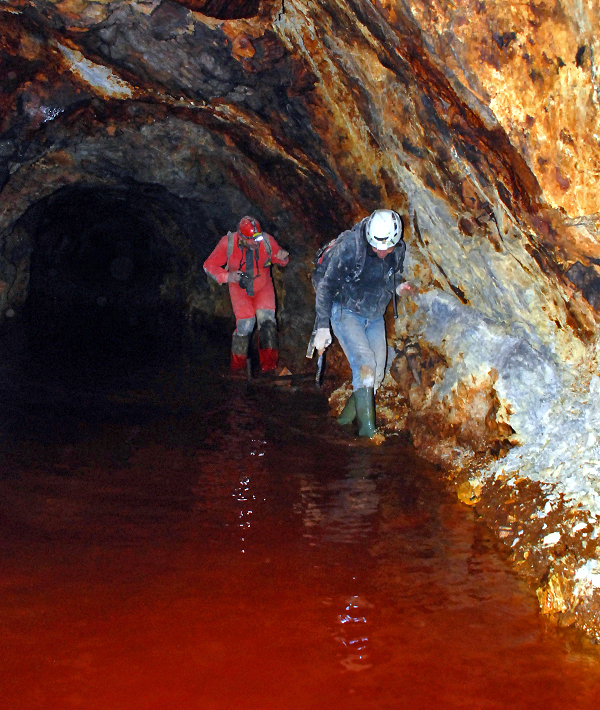 Some tunnels in the lower level of Breiner Mine are partly flooded, high content of iron in the water causes the red color. P. Żochowski photo. 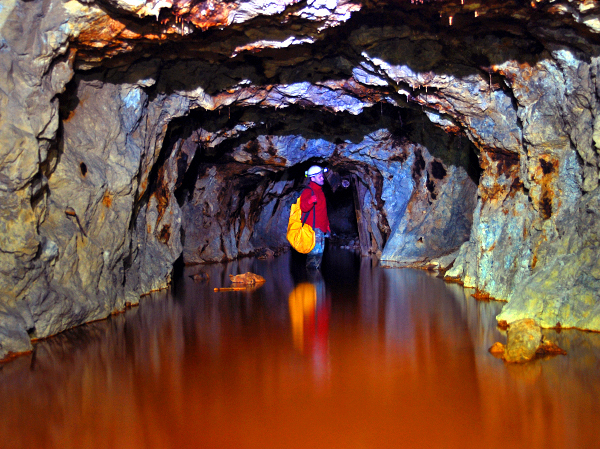 Going through the partly flooded lower level of Breiner Mine. P. Żochowski photo. 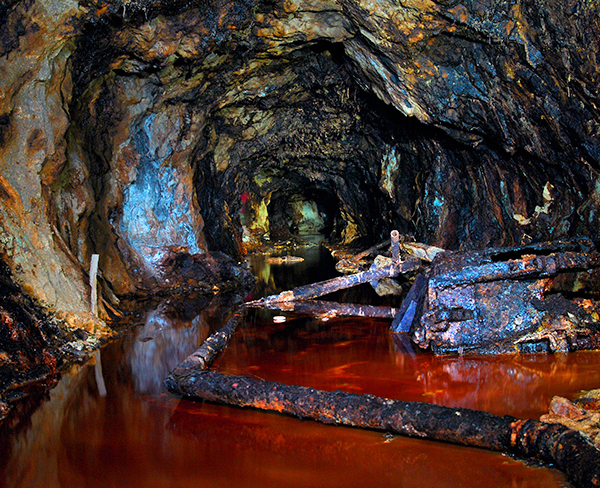 Partly floded tunnel in the lower level of Breiner Mine. P. Żochowski photo. 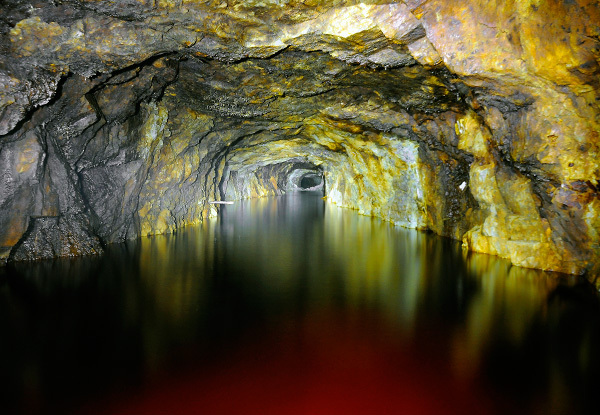 Partly flooded tunnel in the lower level of Breiner Mine, high content of iron in the water causes the red color. P. Żochowski photo. 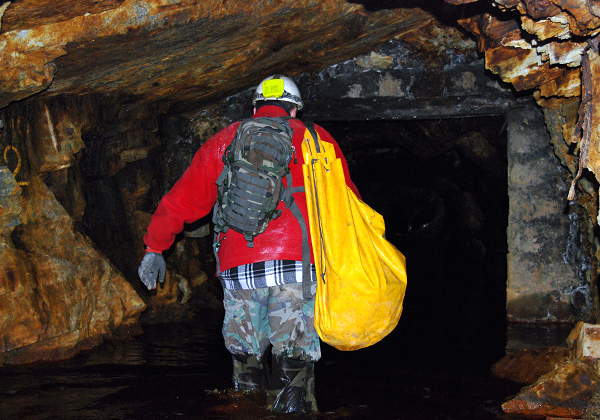 Going through the partly flooded lower level of Breiner Mine. 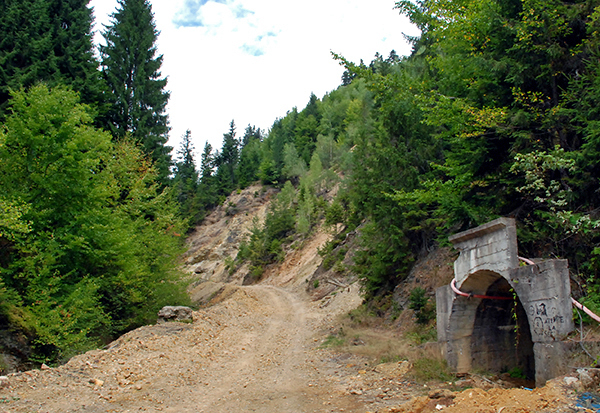 S. Krupa photo. 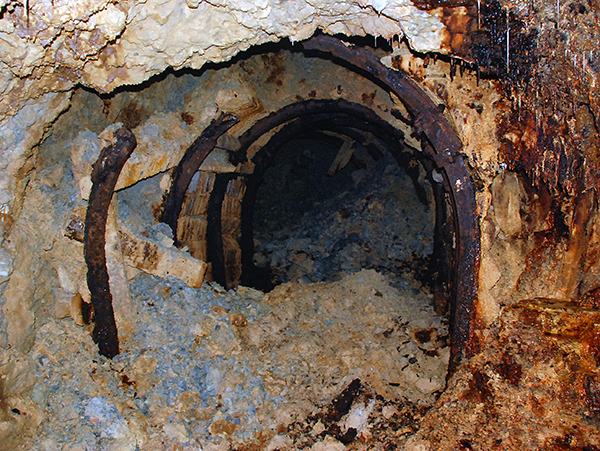 Some parts of the lower level remain dry with preserved wooden ore shut. P. Żochowski photo. 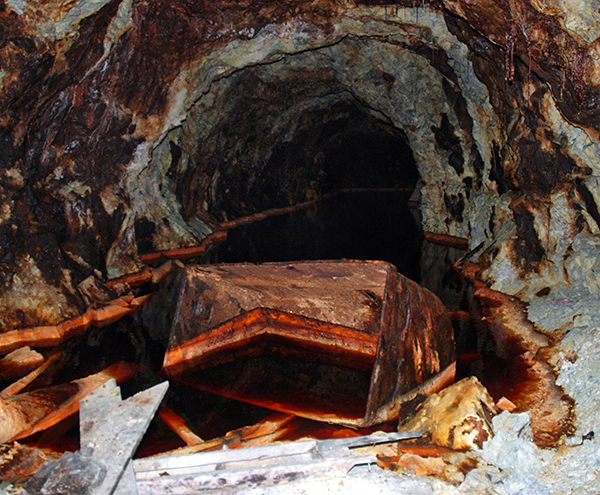 Wooden ore shut and rusted mining carts left in the lower level of Breiner Mine. P. Żochowski photo. 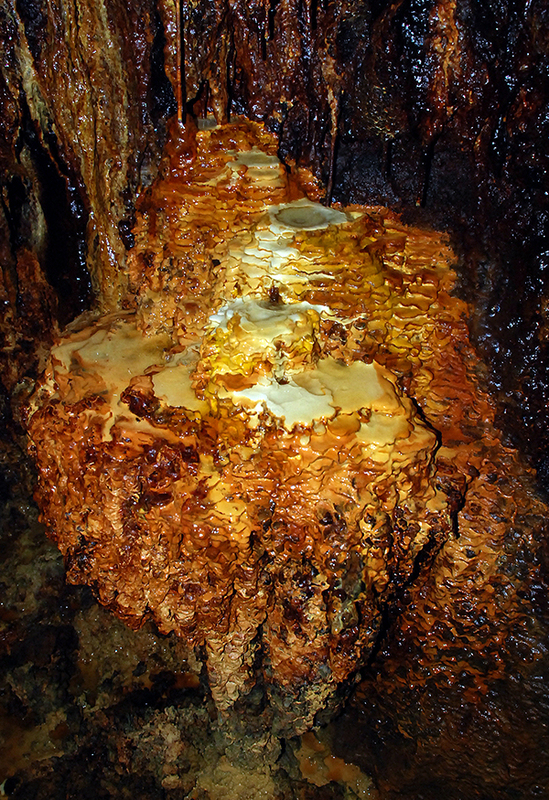 Wooden ore shut in the lower level of Breiner Mine. P. Żochowski photo. 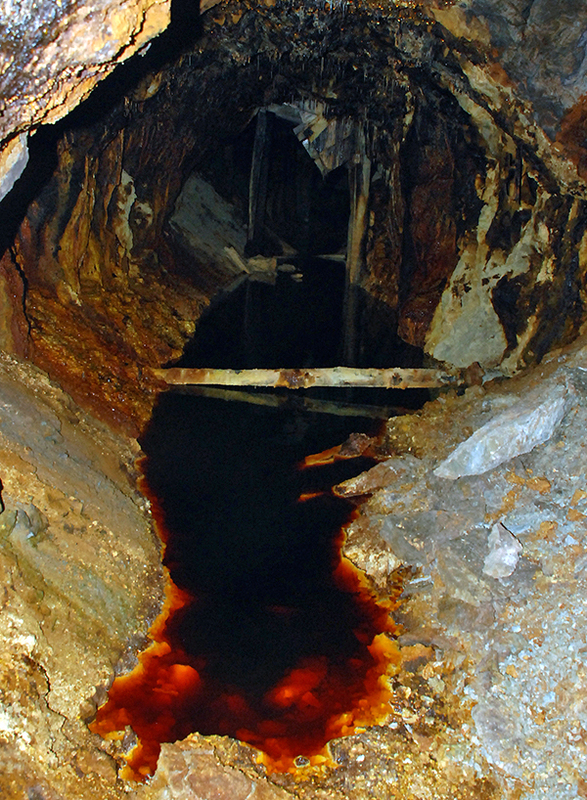 Rusted mining cart left in the lower level of Breiner Mine. P. Żochowski photo. 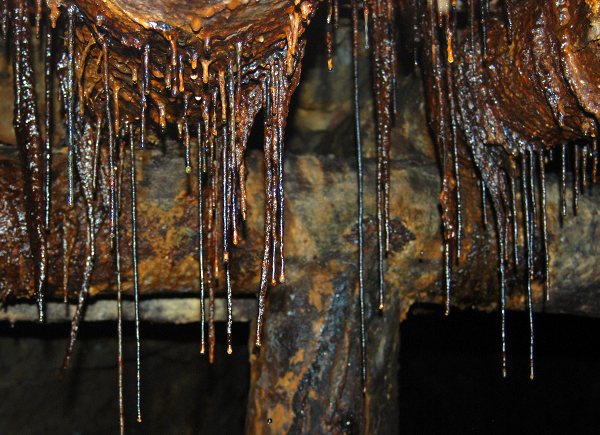 Iron oxide stalactites and rusted mining cart left in the lower level of Breiner Mine. P. Żochowski photo. 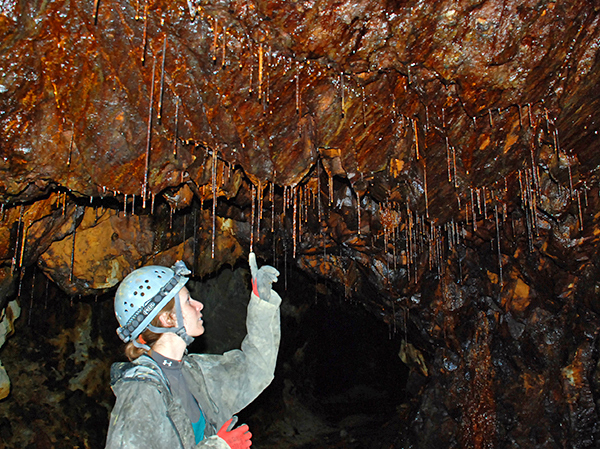 Numerous iron oxide stalactites in the lower level of Breiner Mine. P. Żochowski photo. 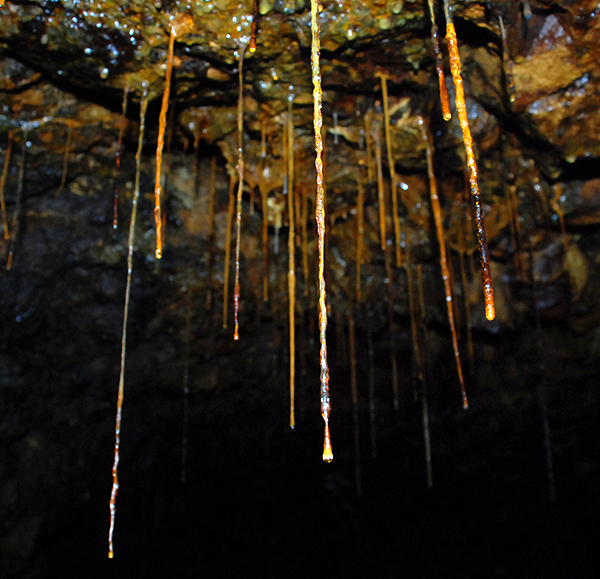 Iron oxide stalactites in the lower level of Breiner Mine. P. Żochowski photo. 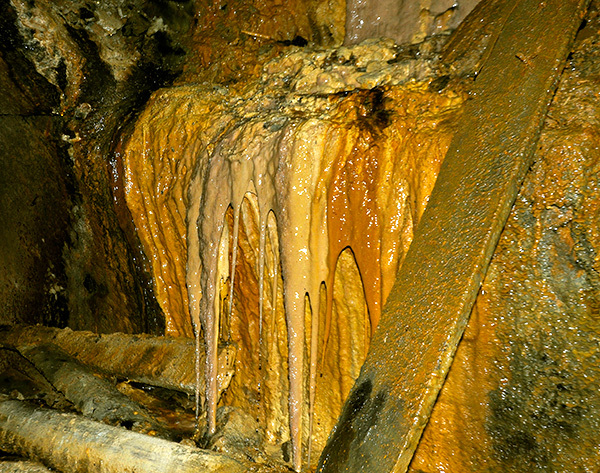 Mixed calcareous and iron oxide stalactites in the lower level of Breiner Mine. P. Żochowski photo. 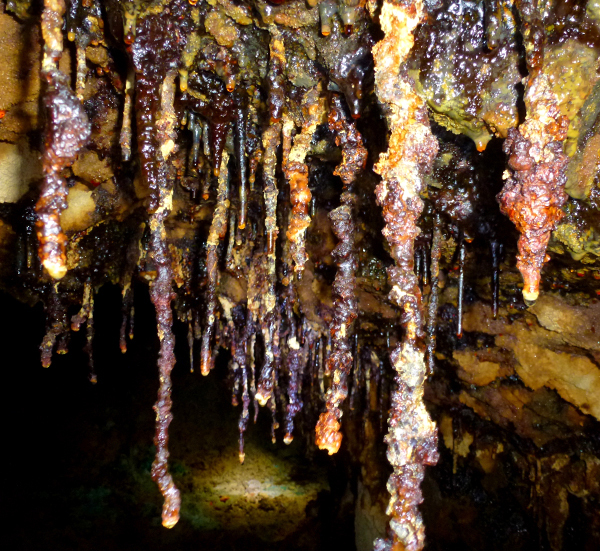 Iron oxide stalactites and dripstones in the lower level of Breiner Mine. P. Żochowski photo. 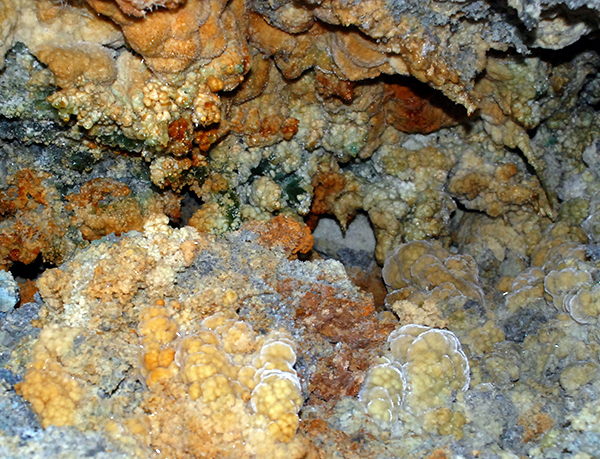 Iron oxides and calcareous dripstones in the lower level of Breiner Mine. P. Żochowski photo. 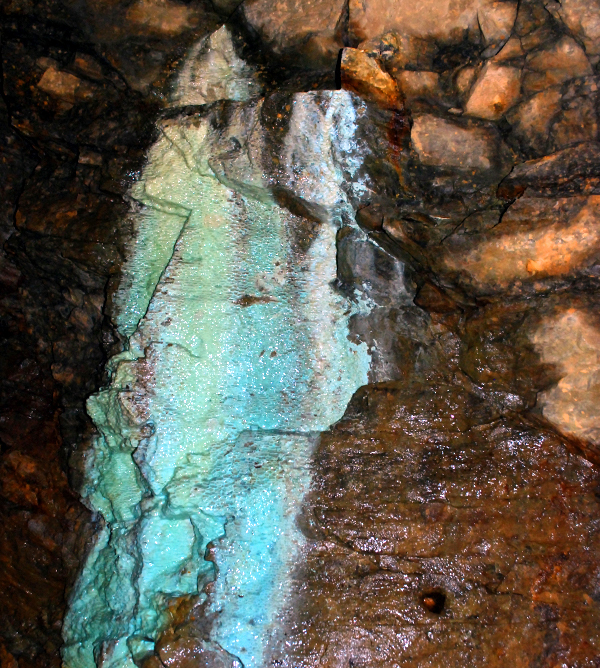 Dripstones in the lower level of Breiner Mine. P. Żochowski photo. 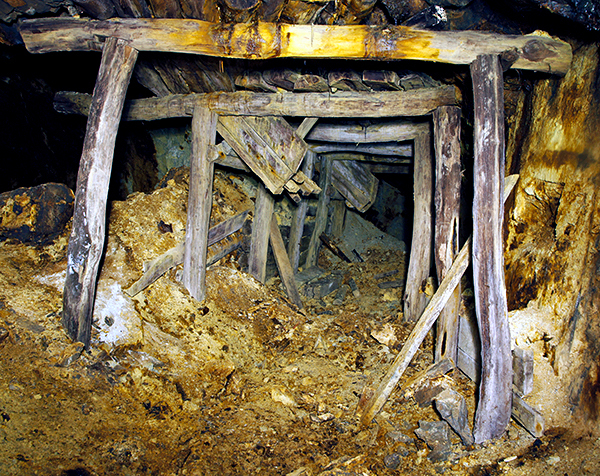 Wooden constructions partly covered with dripstones in the lower level of Breiner Mine. P. Żochowski photo. 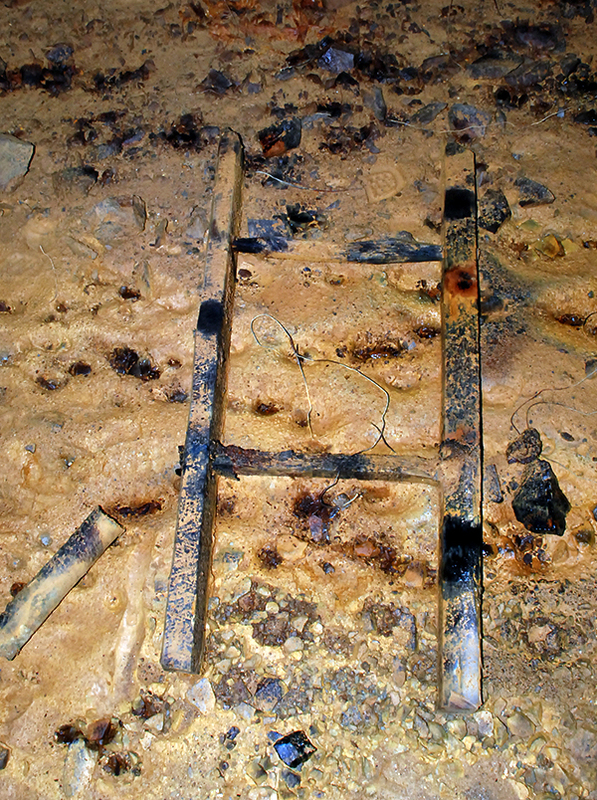 Old ladder in the lower level of Breiner Mine. P. Żochowski photo. 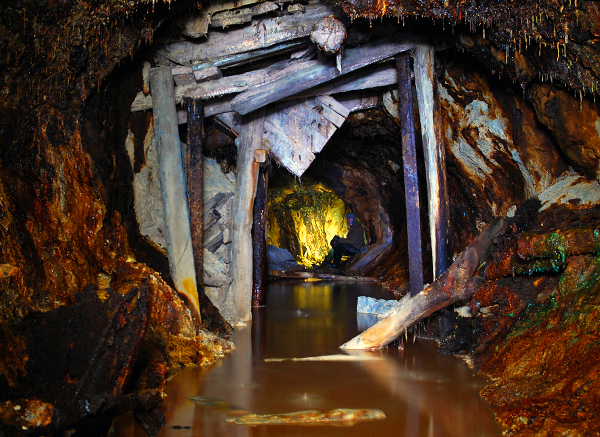 Walking through the mud in the lower level of Breiner Mine. 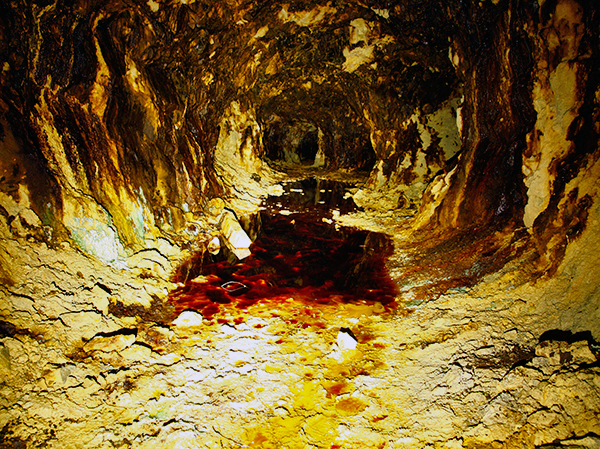 S. Krupa photo. 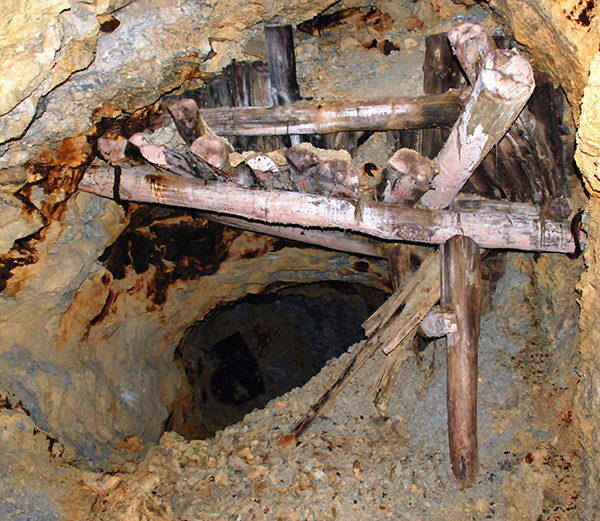 Old shaft with wooden ground support in the lower level of Breiner Mine. P. Żochowski photo. 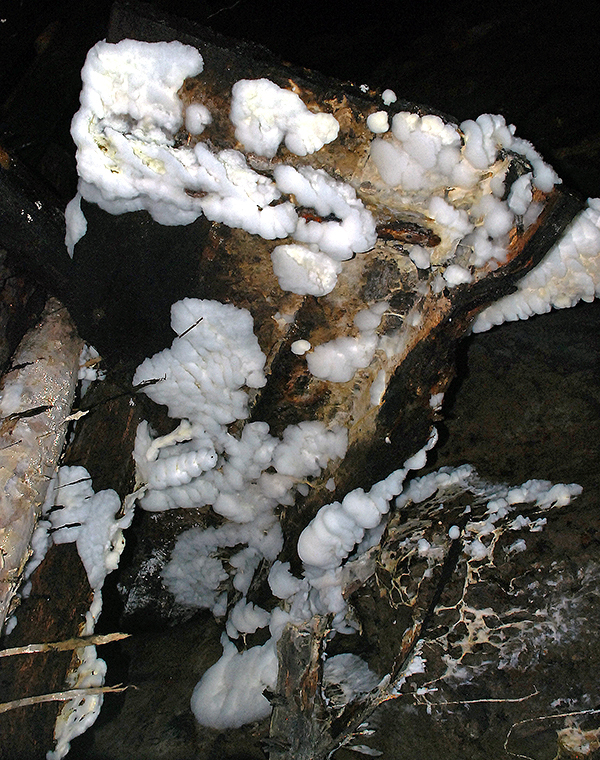 Fungus on timbering in the lower level of Breiner Mine. 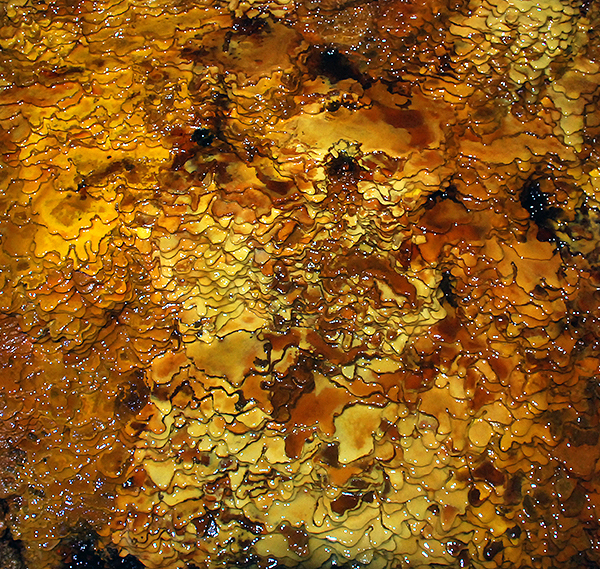 S. Krupa photo. 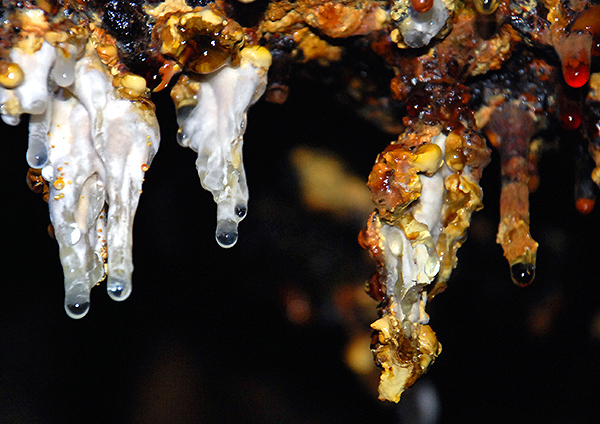 Fungus on wooden elements of ground support in the lower level of Breiner Mine. 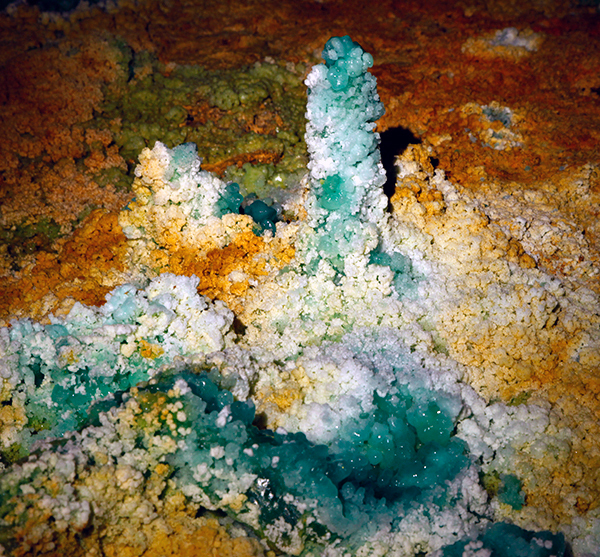 S. Krupa photo. 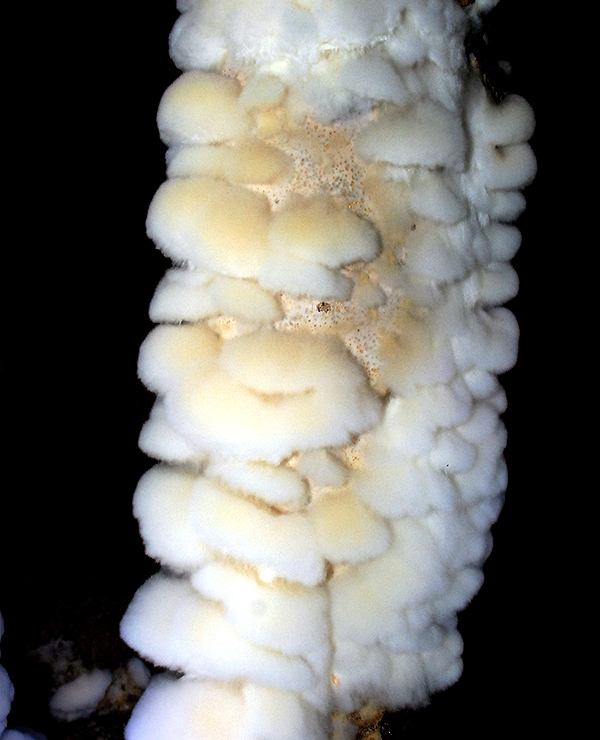 Fungus in the lower level of Breiner Mine. 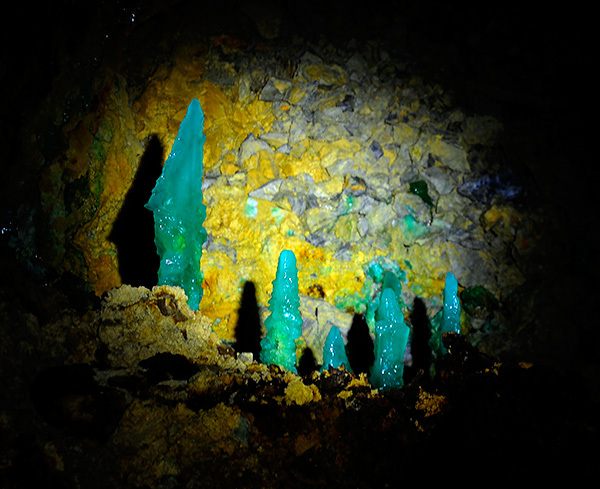 S. Krupa photo. 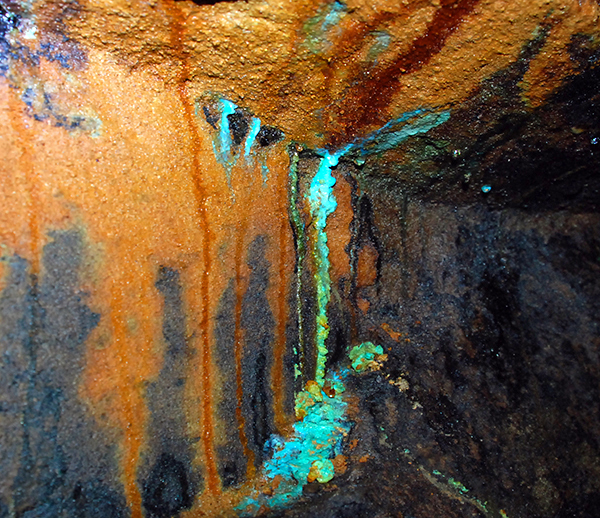 Calcareous dripsones enriched in copper in the lower level of Breiner Mine. P. Żochowski photo. 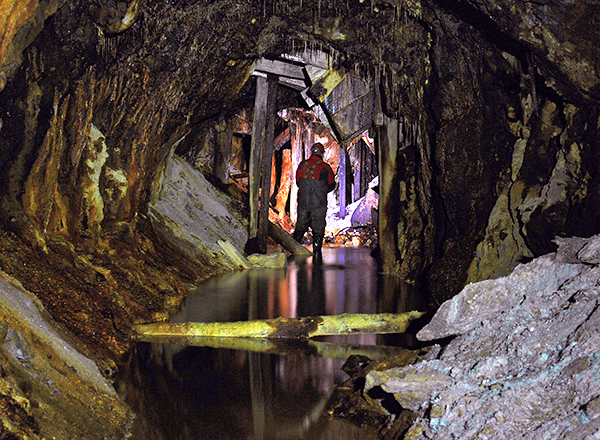 Tunnel with timbering and mining carts, in the left side of the photo melanterite stalagmites are visible. 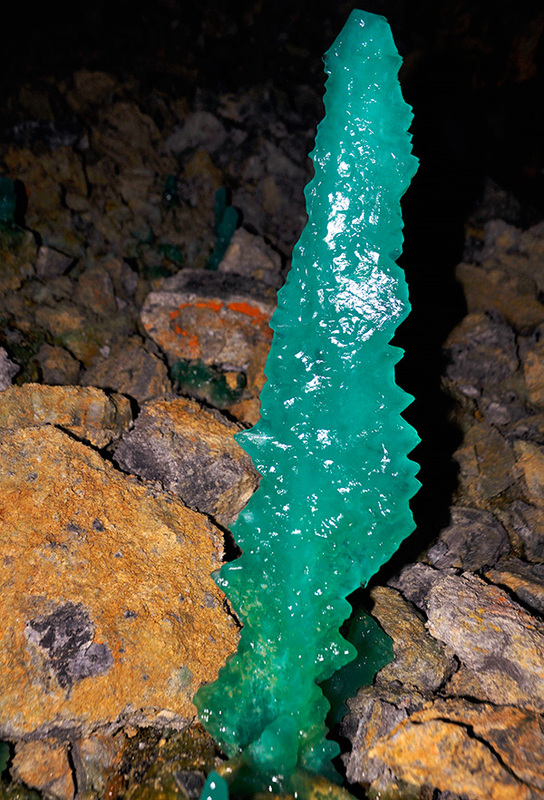 This secondary mineral is responsible for the most colorful and spectacular forms in the mines in the area, unfortunately it is unstable in "home conditions". 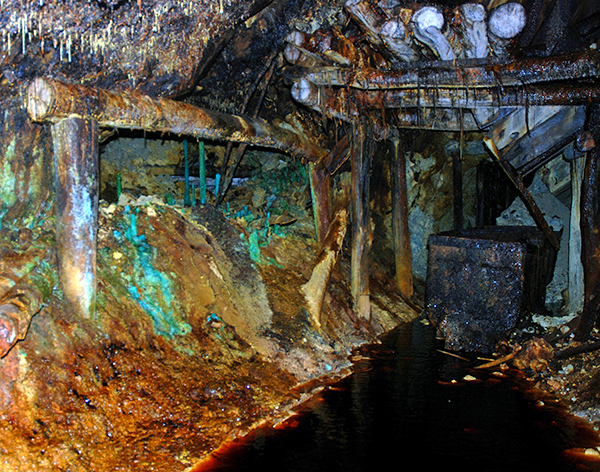 Lower level of the Breiner Mine. P. Żochowski photo. 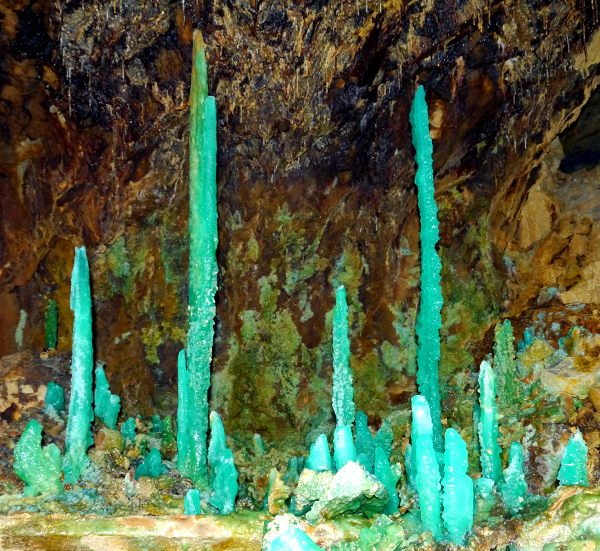 Melanterite stalactites in the lower level of the Breiner Mine. 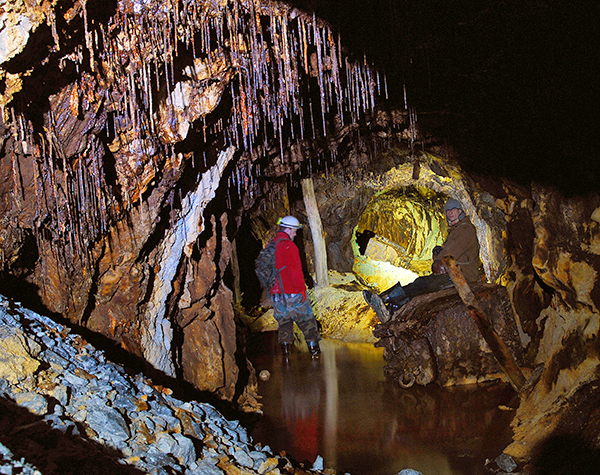 S. Krupa photo. 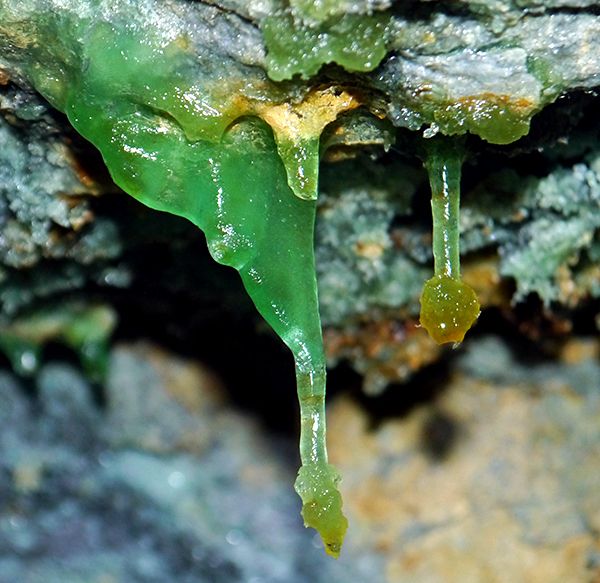 Melanterite stalactites adn dripingstones in the lower level of the Breiner Mine. P. Żochowski photo. 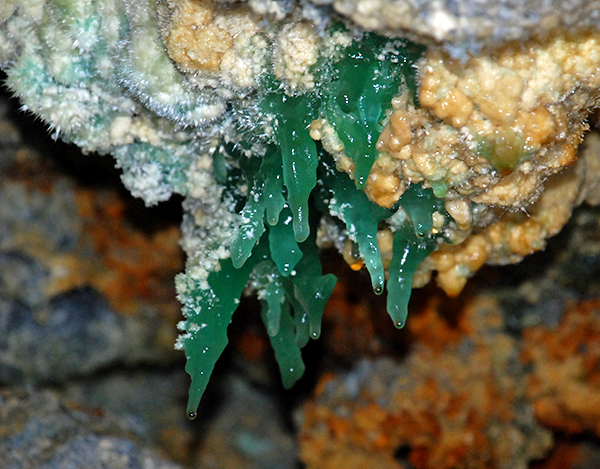 Melanterite stalactites in the lower level of the Breiner Mine. 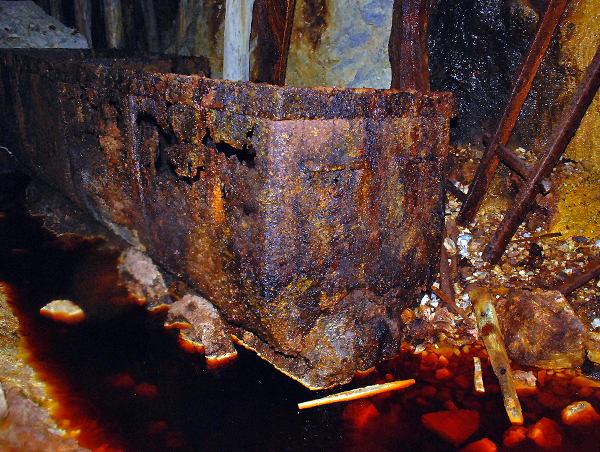 K. Dembicz photo. 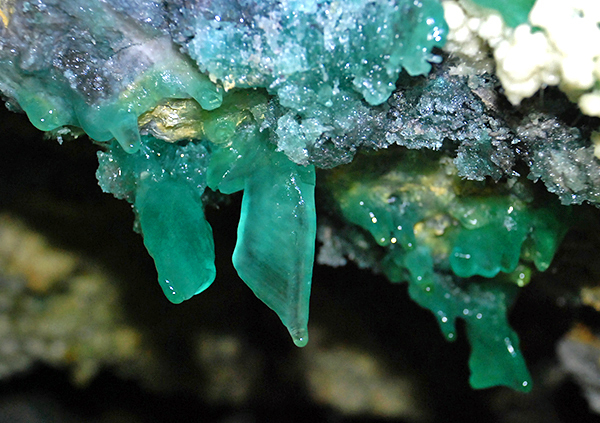 Melanterite stalactites, some probably enriched in Fe, lower level of the Breiner Mine. 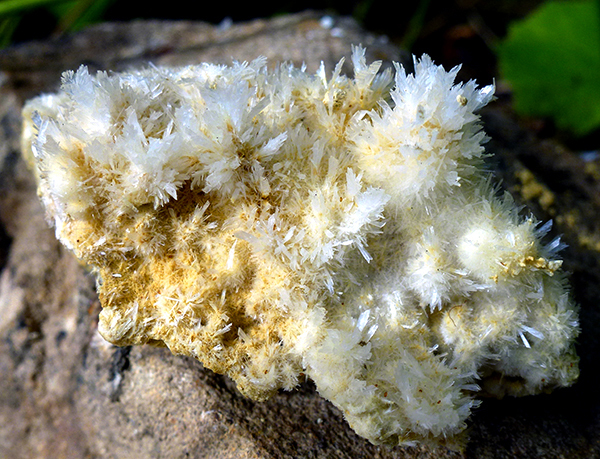 K. Dembicz photo. 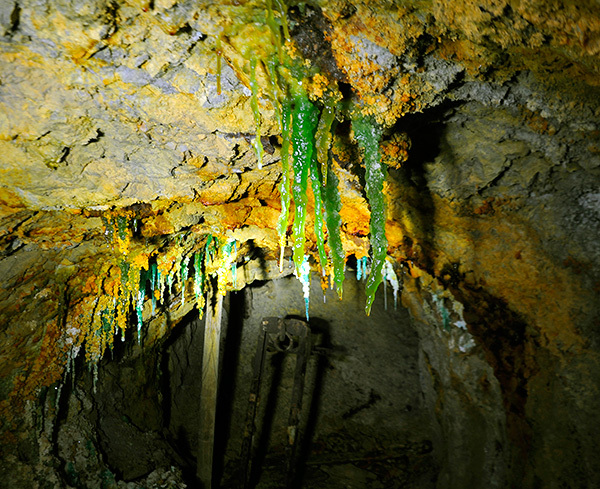 Melanterite stalactites on the tunnel`s ceiling, the lower level of the Breiner Mine. P. Żochowski photo. 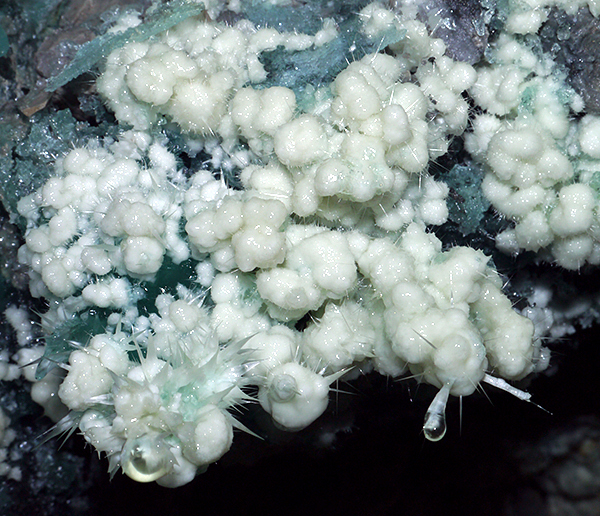 Melanterite stalagmites and dripstones, lower level of the Breiner Mine. P. Żochowski photo. 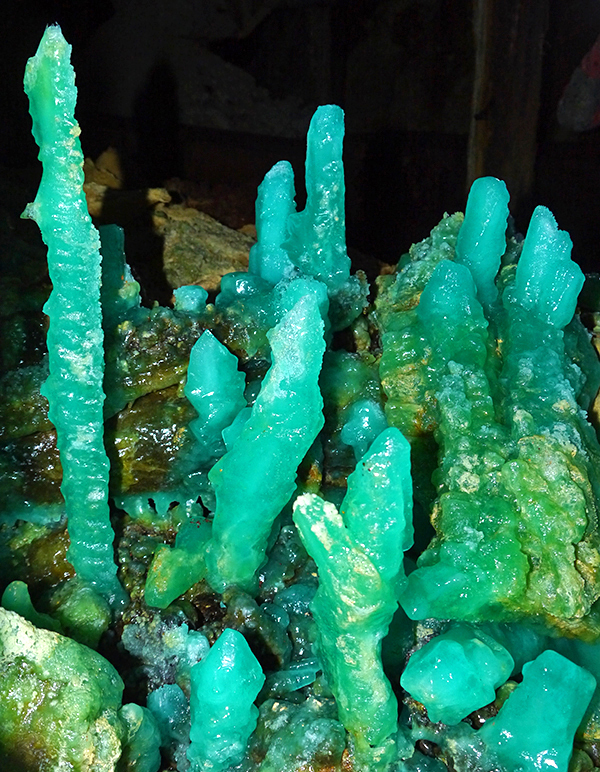 Melanterite stalagmites, lower level of the Breiner Mine. P. Żochowski photo. 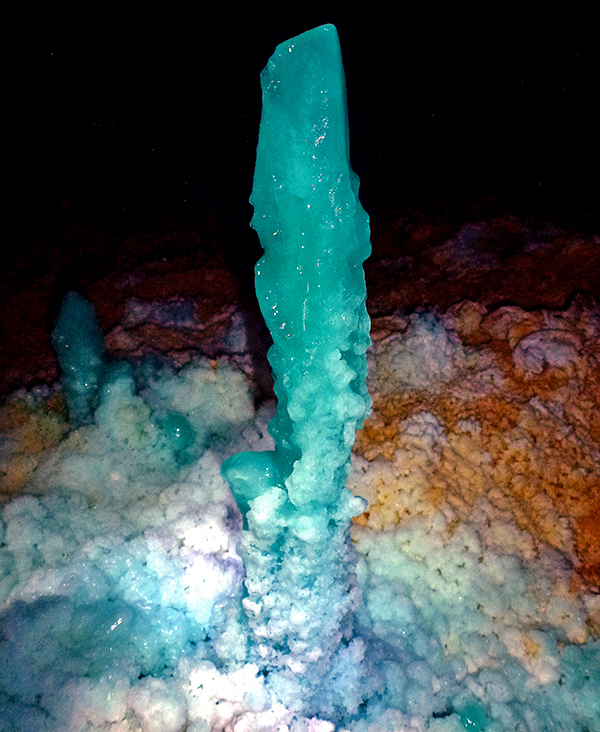 Melanterite stalagmite, lower level of the Breiner Mine. P. Żochowski photo. 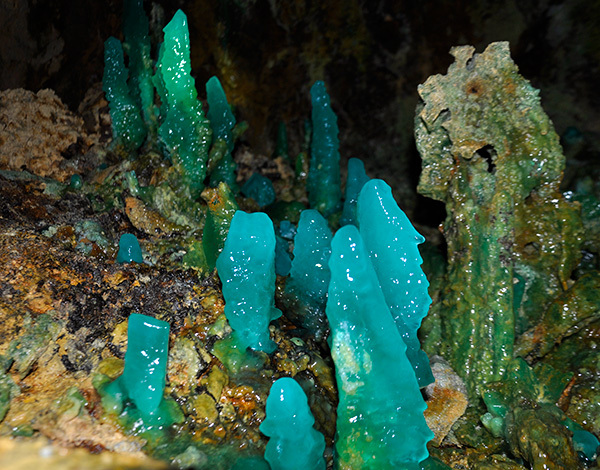 Melanterite stalagmites "forest", lower level of the Breiner Mine. P. Żochowski photo. 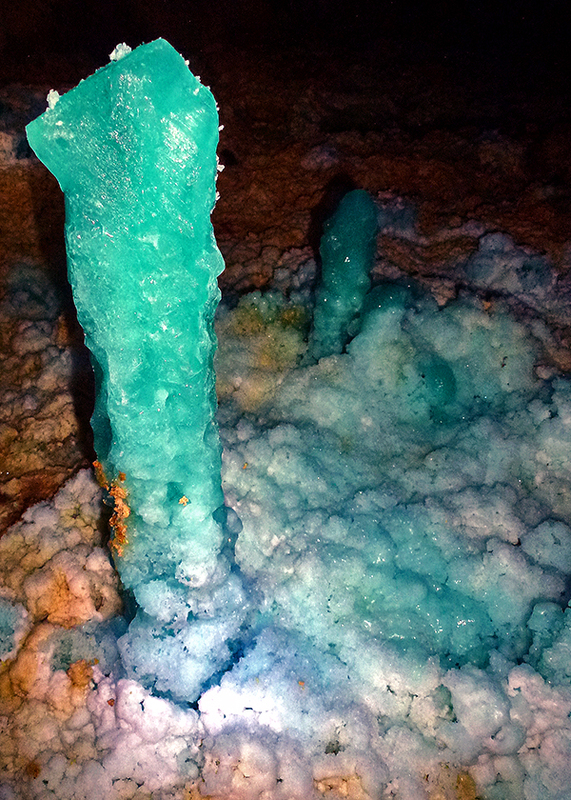 Giant melanterite stalagmites "forest", lower level of the Breiner Mine. P. Żochowski photo. 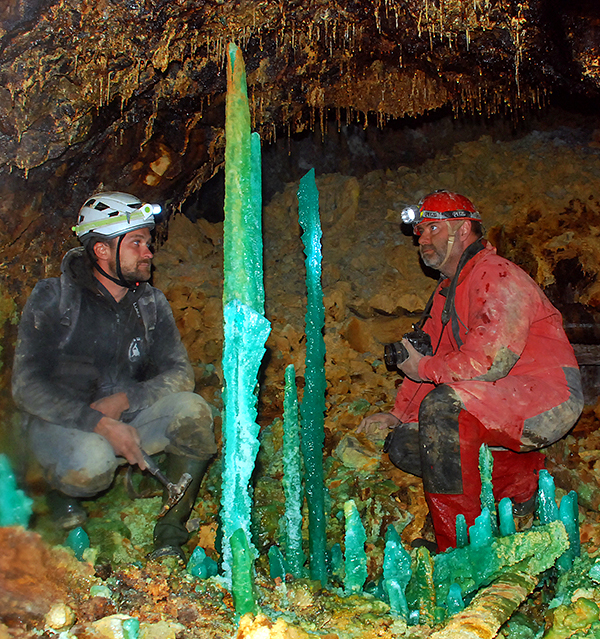 Explorers surrounded by the "forest" of giant melanterite stalagmites, lower level of Breiner Mine. 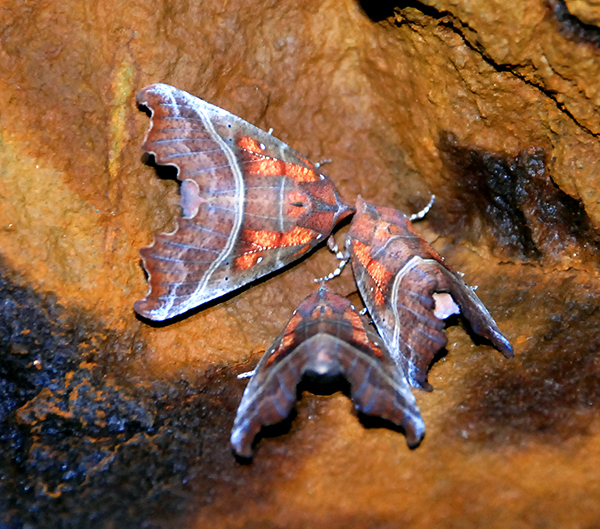 S. Krupa photo. 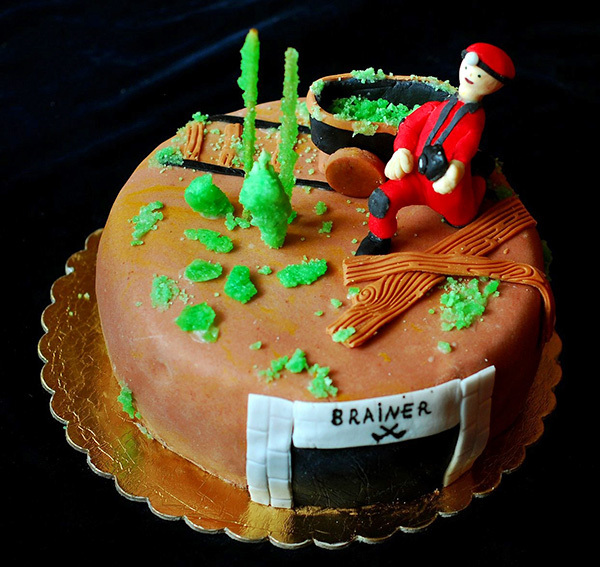 Special cake showing the explorer in Breiner mine surrounded by melanterite stalagmites. 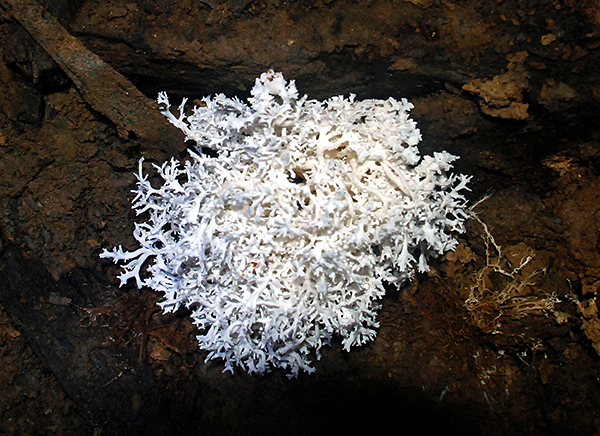 K. Tupik photo. 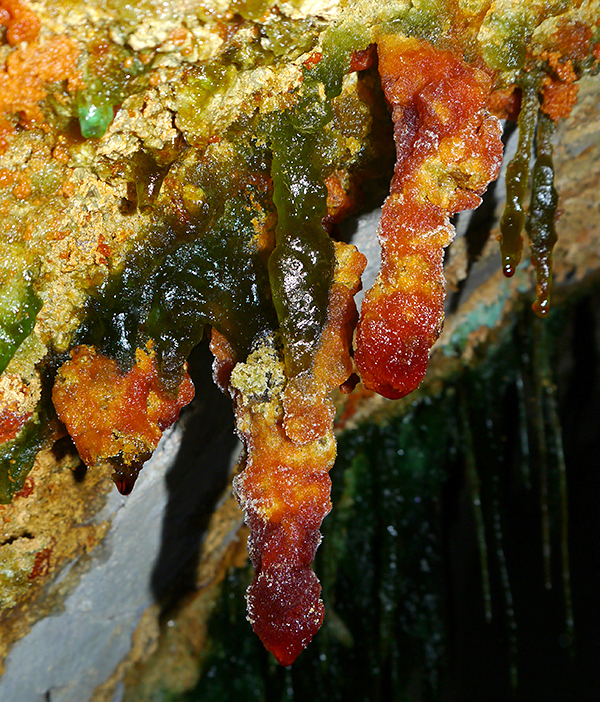 Going back, almost on the surface. P. Żochowski photo. 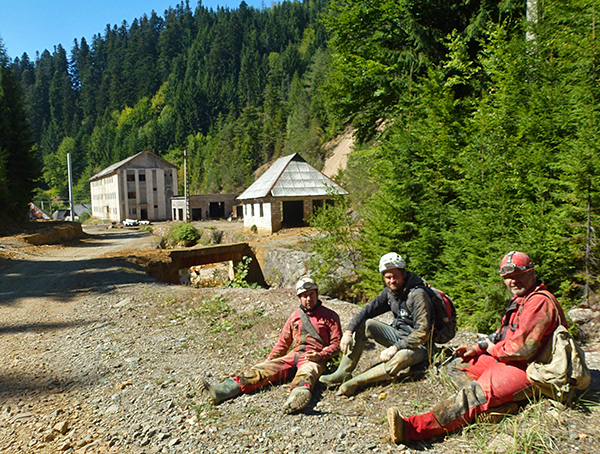 Happy and tired explorers are back to the surface after visiting the lower level of the Breiner Mine. K. Litwin photo. Upper level is much drier than the lower one, as it is located higher in the mountains. 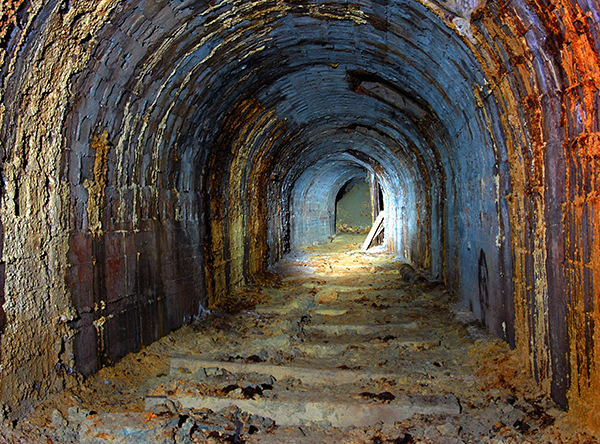 It is also more dangerous as it was abandoned much earlier and not maintained for a long time. 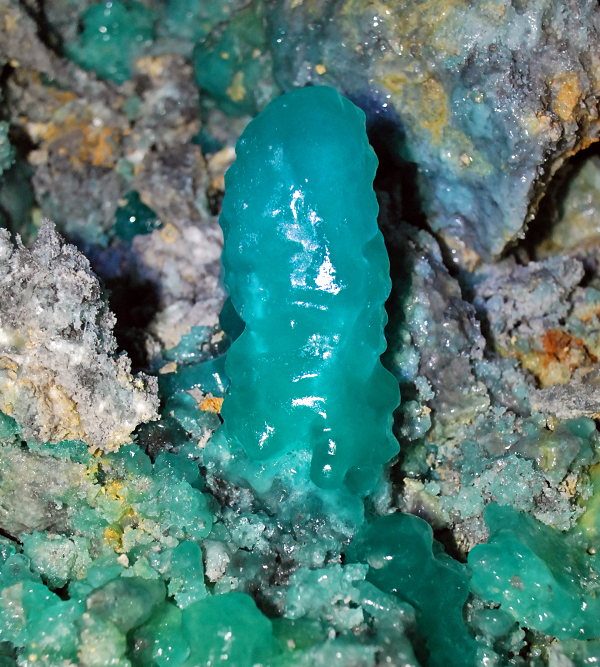 Upper level also has quite rich secondary minerals mineralization, especially melanterite stalagmites and halotrichite group hair-like minerals. 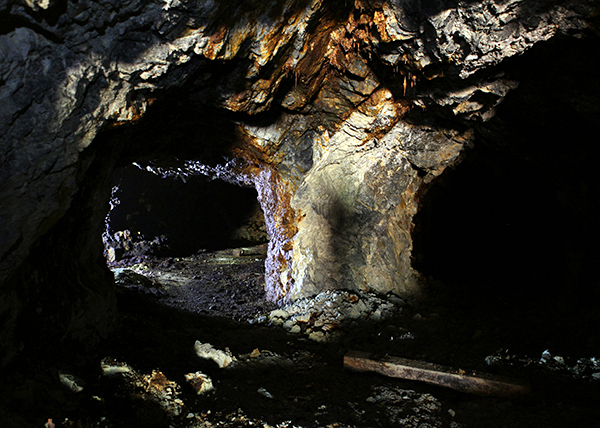 Adit to the upper level of Breiner mine is quite rough, this part of the mine was abandoned a long time ago. 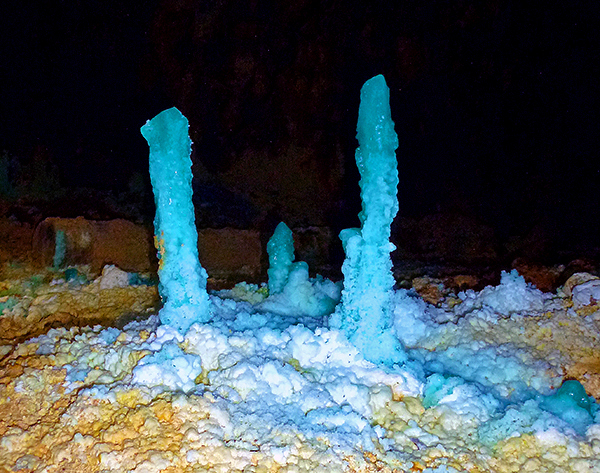 K. Trela photo. 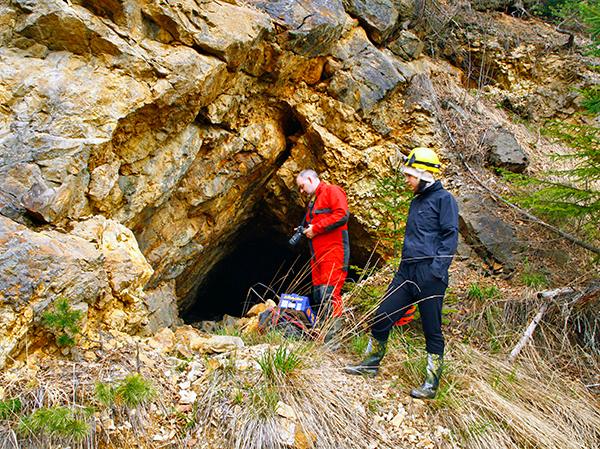 Ready to go underground to the upper level of Breiner Mine. K. Trela photo. 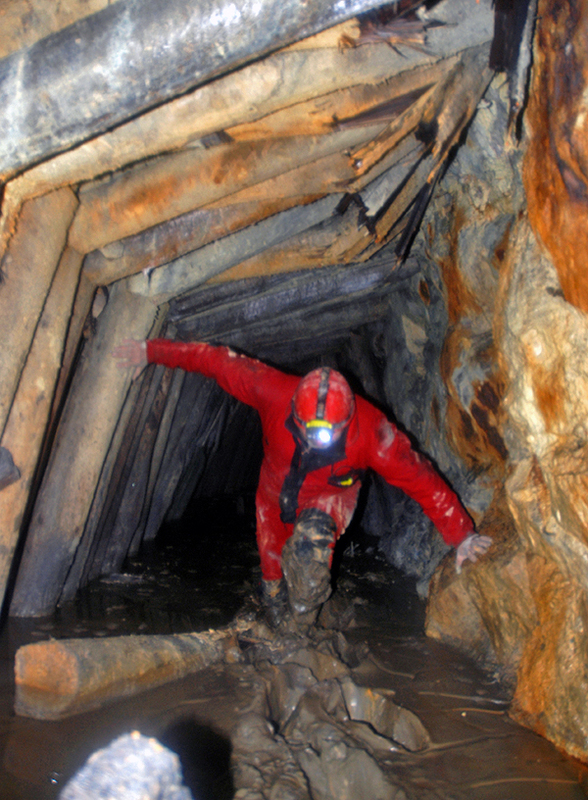 Going underground in the upper level of the Breiner Mine. 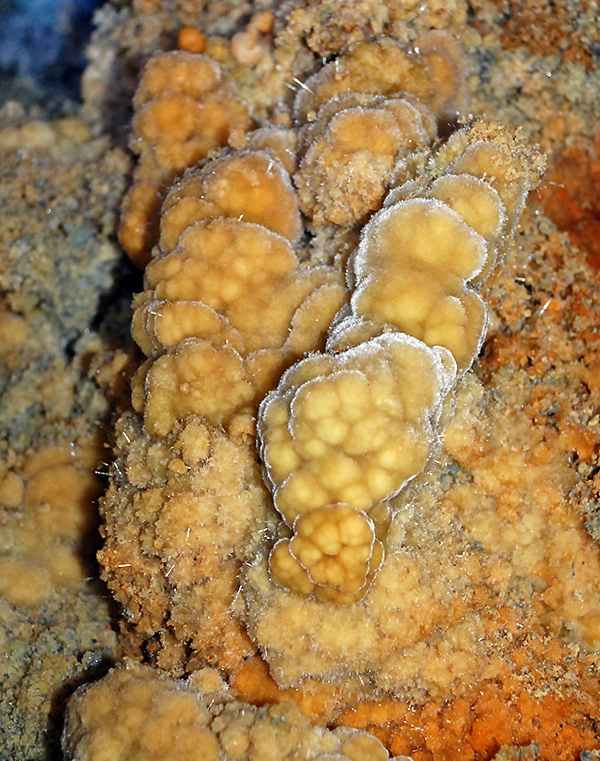 K. Trela photo. 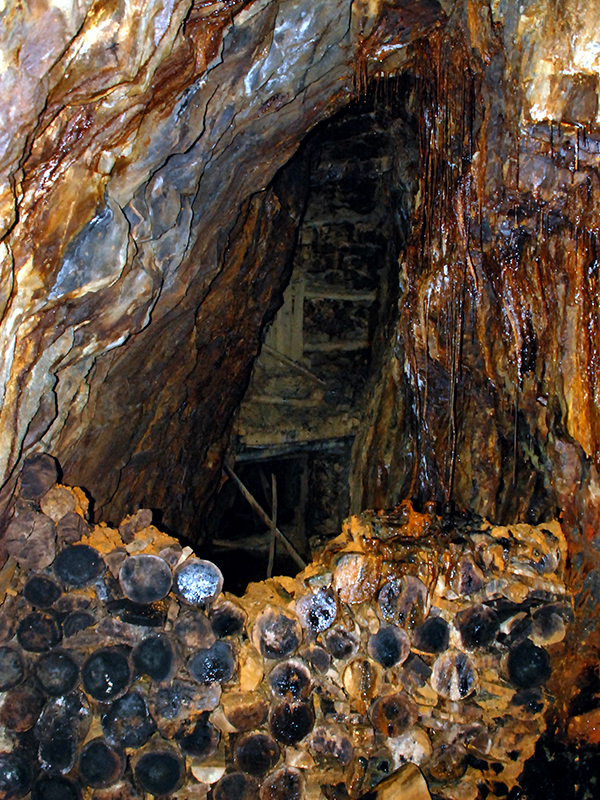 Wooden ore shut, upper level of the Breiner Mine. P. Żochowski photo. 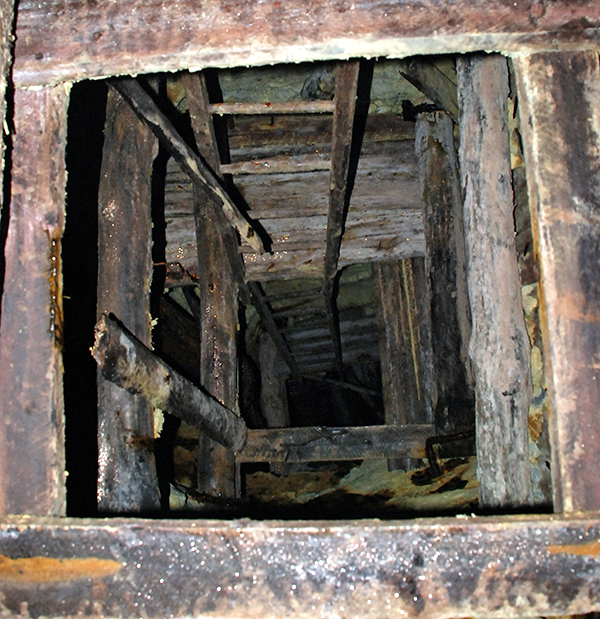 Wooden constructions, upper level of the Breiner Mine. P. Żochowski photo. 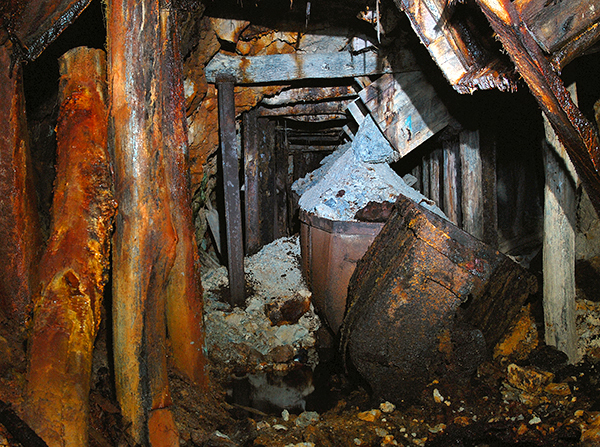 Steel ground support system, upper level of the Breiner Mine. P. Żochowski photo. 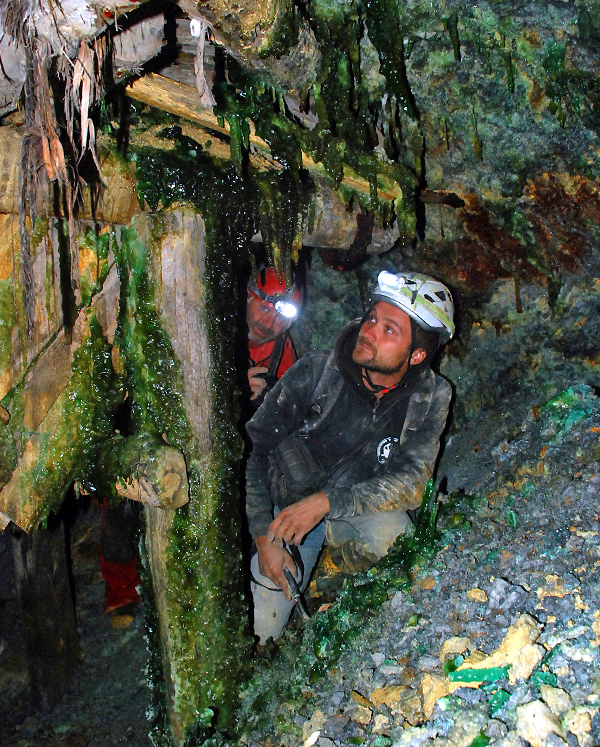 In the upper level of the Breiner Mine. K. Trela photo. 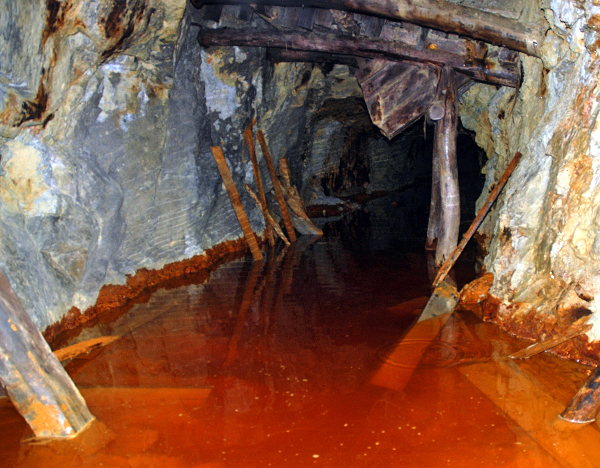 Water with high iron content in the upper level of the Breiner Mine. P. Żochowski photo. 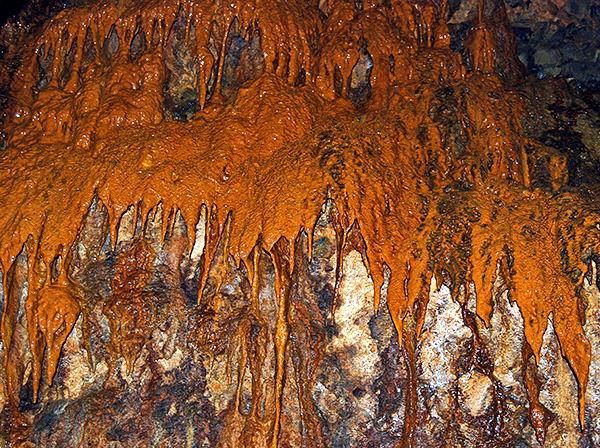 Iron oxide stalactites in the upper level of the Breiner Mine. P. Żochowski photo. 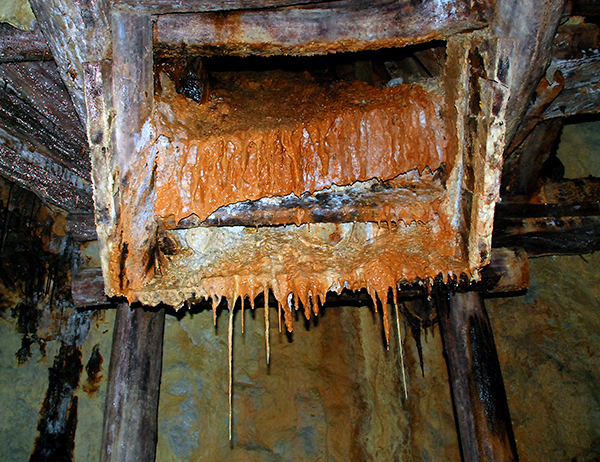 Iron oxide stalactites in the upper level of the Breiner Mine. 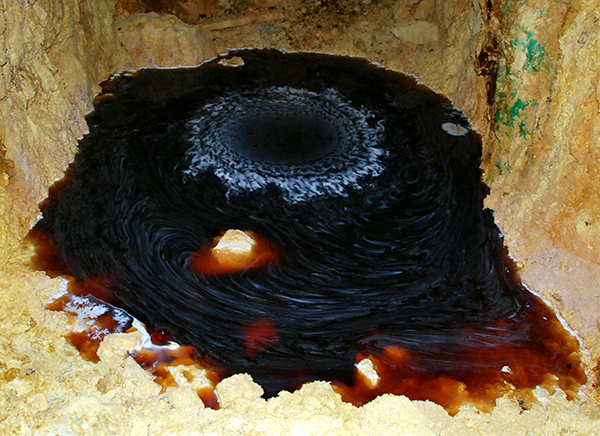 S. Krupa photo. 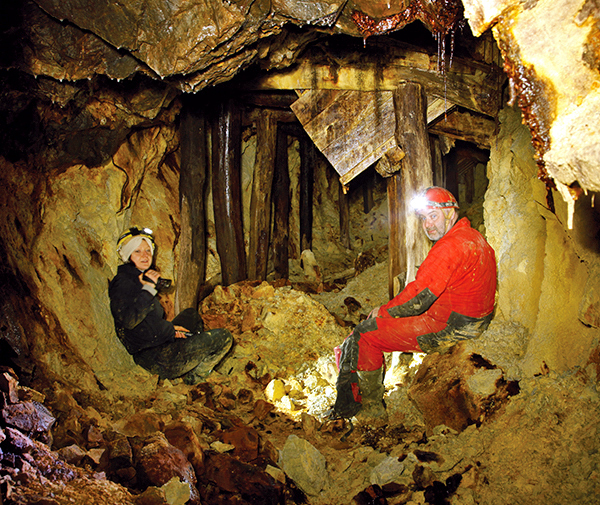 Resting in the upper level of the Breiner Mine. 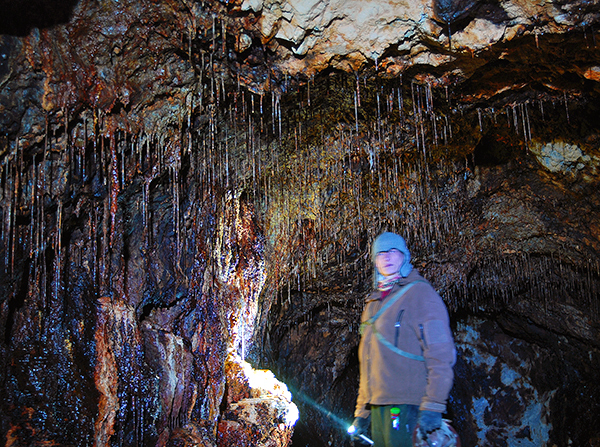 K. Trela photo. 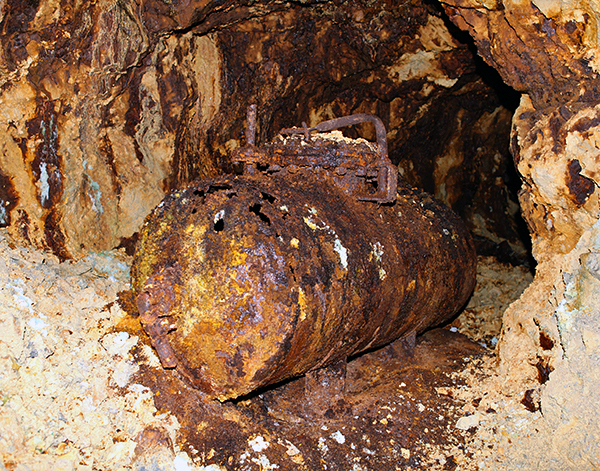 Rusted tank in the upper level of the Breiner Mine. P. Żochowski photo. 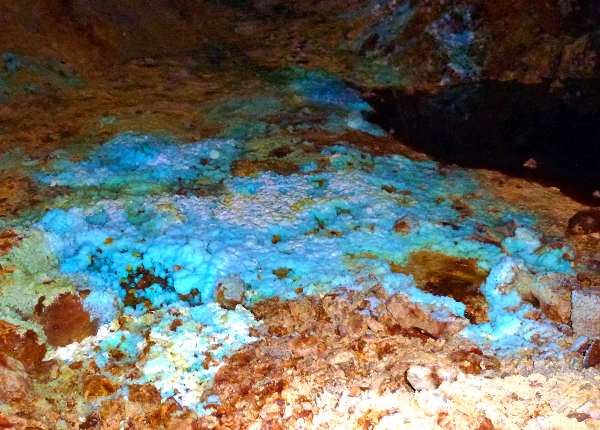 Mosses in the upper level of the Breiner Mine. P. Żochowski photo. 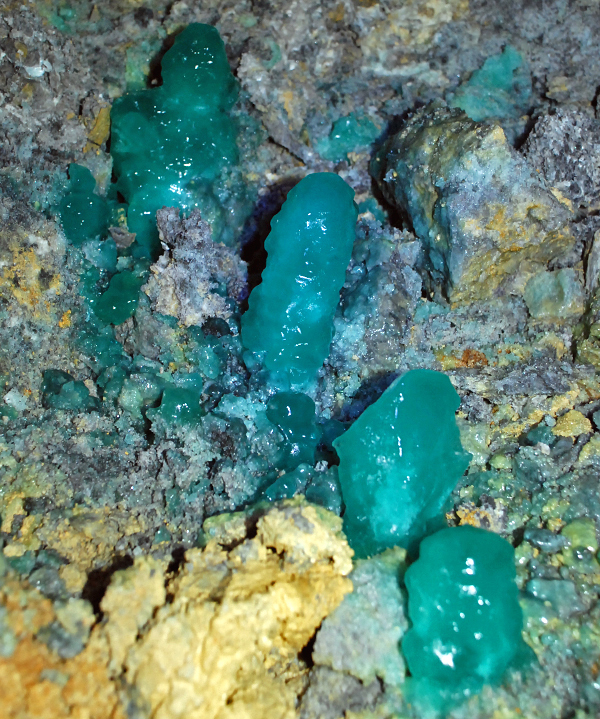 Melanterite dripstones in the upper level of the Breiner Mine. P. Żochowski photo. 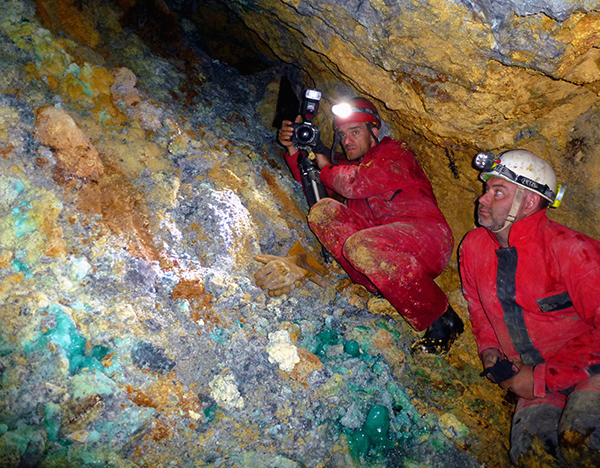 Photographing melanterite dripstones in the upper level of the Breiner Mine. K. Kołodziejska photo. 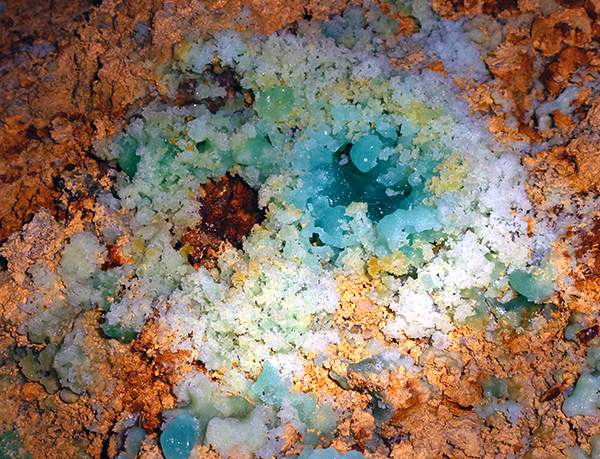 Melanterite and other secondary minerals dripstones in the upper level of the Breiner Mine. P. Żochowski photo. 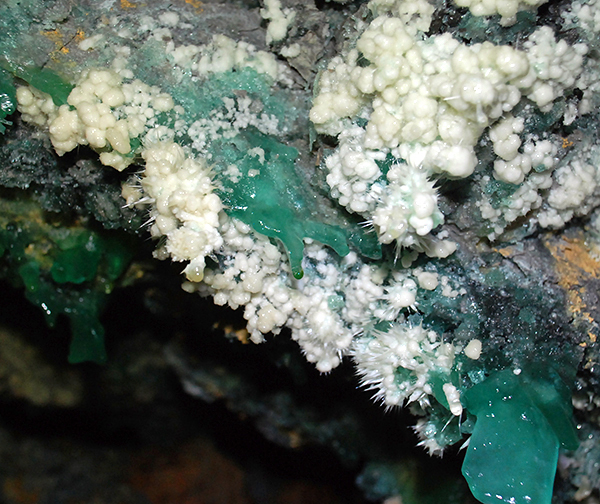 Melanterite and other secondary minerals stalagmites, tunnel in the upper level of the Breiner Mine. P. Żochowski photo. 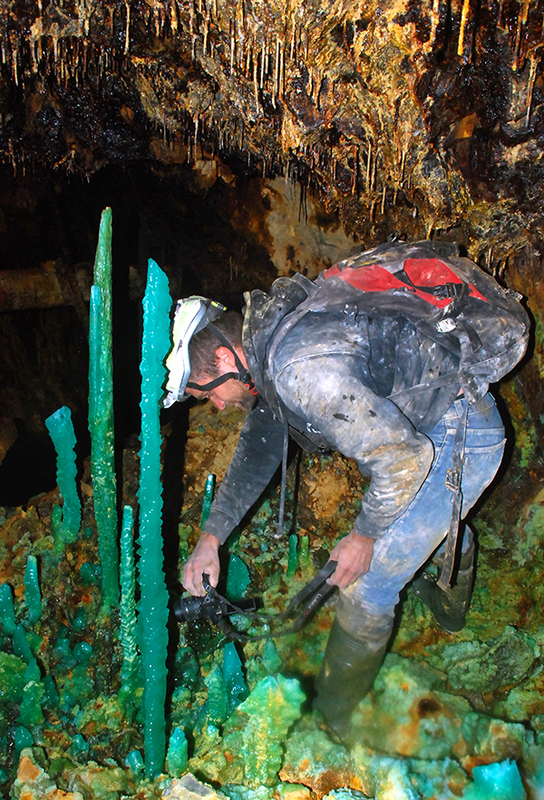 Photographing melanterite stalagmites in the tunnel of upper level of the Breiner Mine. 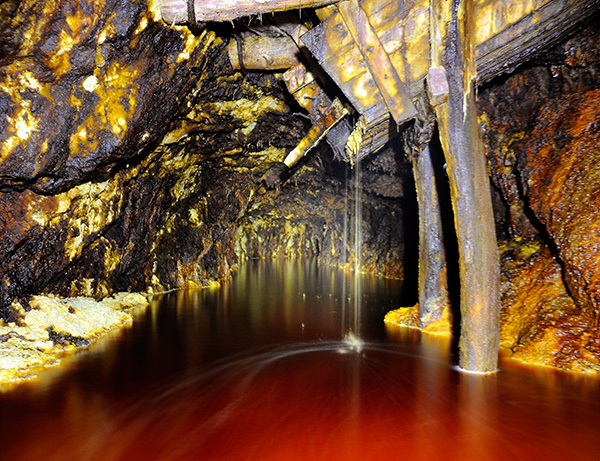 K. Kołodziejska photo. 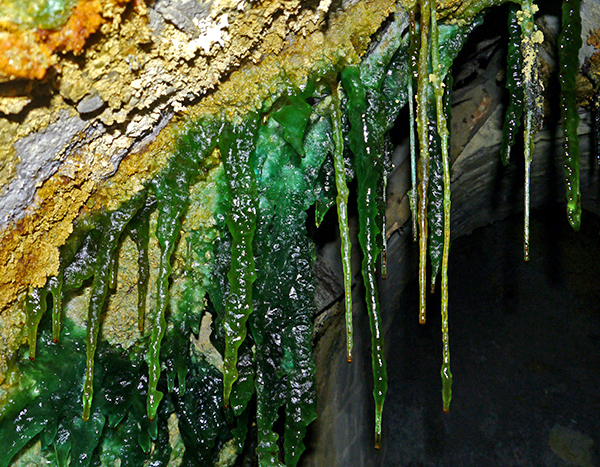 Melanterite stalagmites in the tunnel of upper level of the Breiner Mine. P. Żochowski photo. 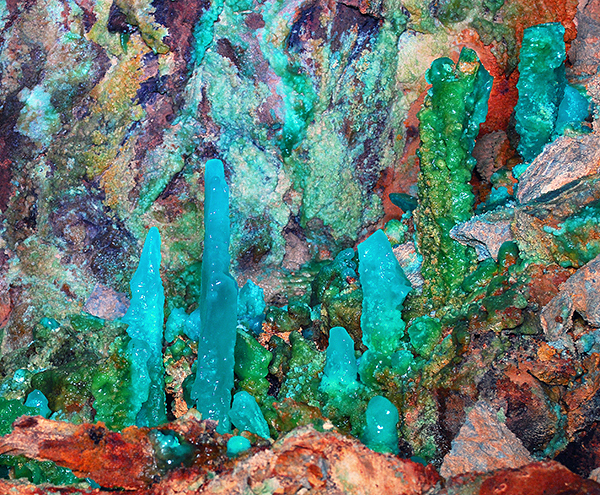 Melanterite and other secondary minerals stalagmites, upper level of the Breiner Mine. 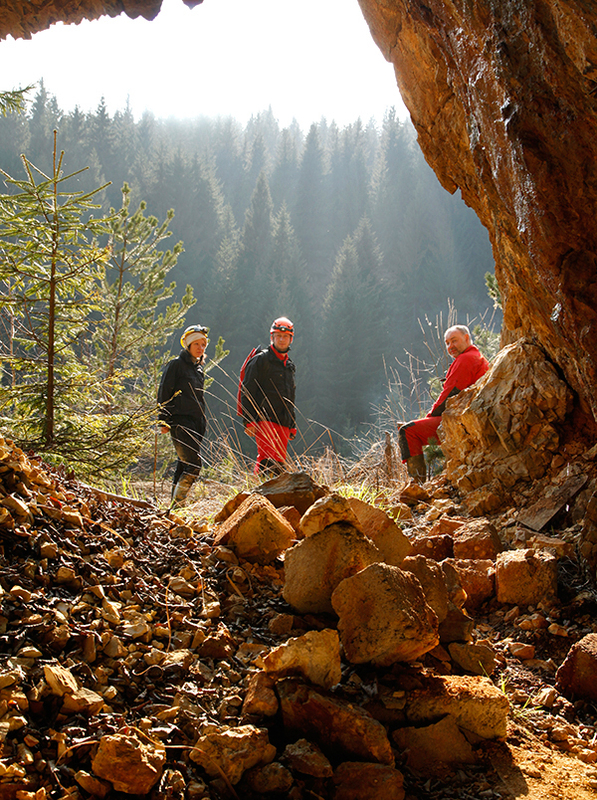 K. Kołodziejska photo. 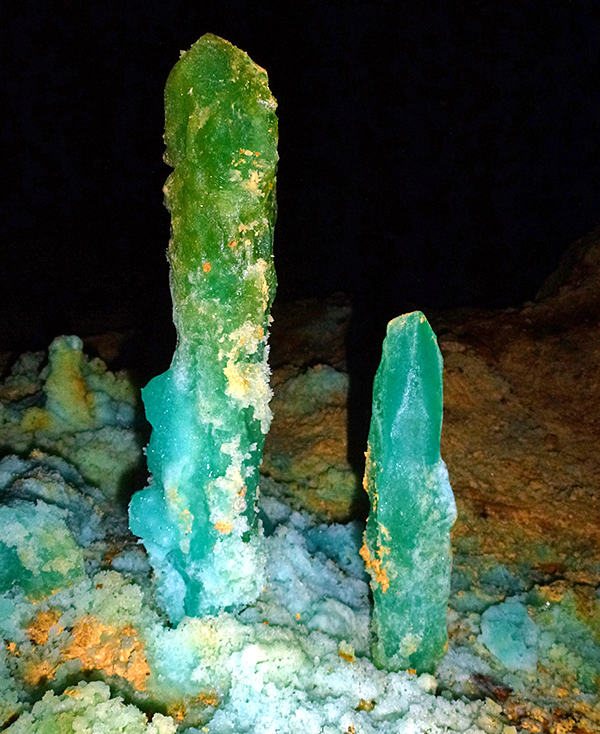 Melanterite stalagmites, upper level of the Breiner Mine. P. Żochowski photo. 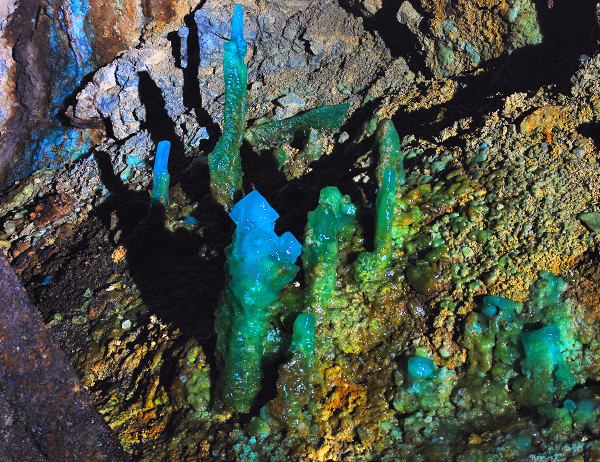 Melanterite stalagmites, upper level of the Breiner Mine. 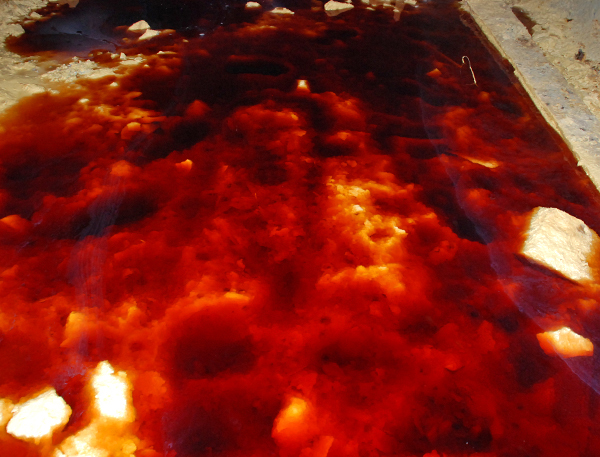 R. Szczot photo. 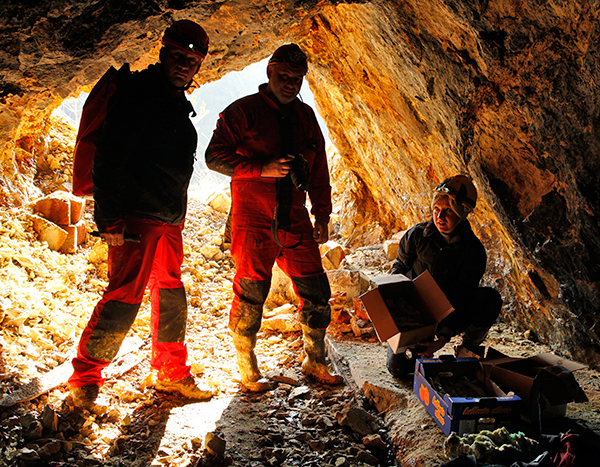 In one area the whole tunnel is covered with the secondary minerals from halotrichite group, upper level of the Breiner Mine. P. Żochowski photo. 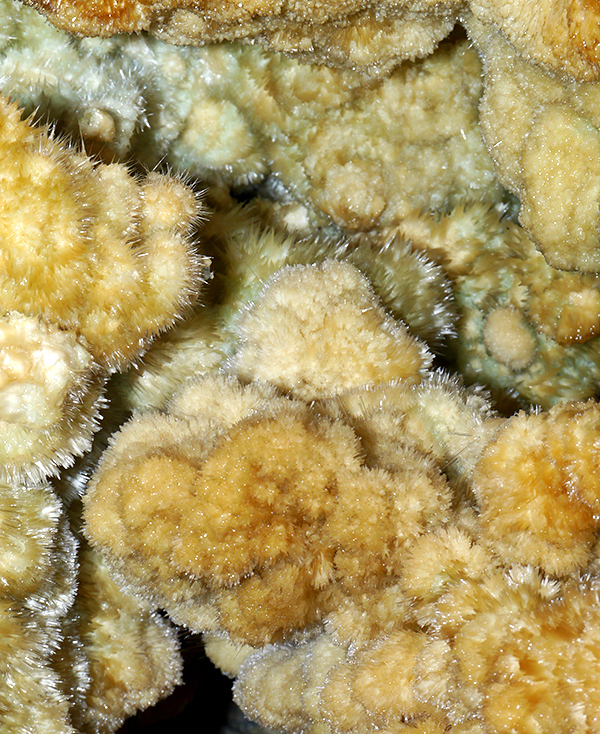 Minerals from the halotrichite group, upper level of the Breiner Mine. P. Żochowski photo. 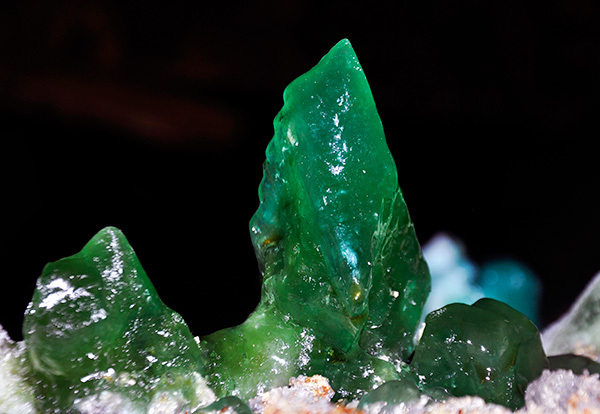 Melanterite and minerals from the halotrichite group, upper level of the Breiner Mine. 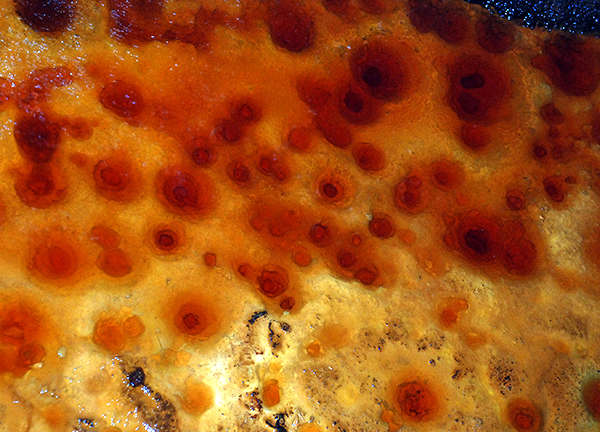 P. Żochowski photo. 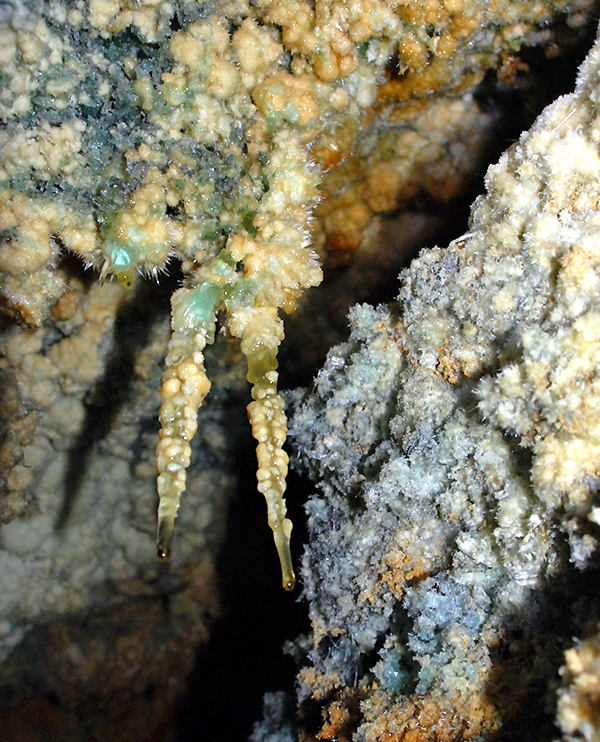 Melanterite stalactites, upper level of the Breiner Mine. P. Żochowski photo. 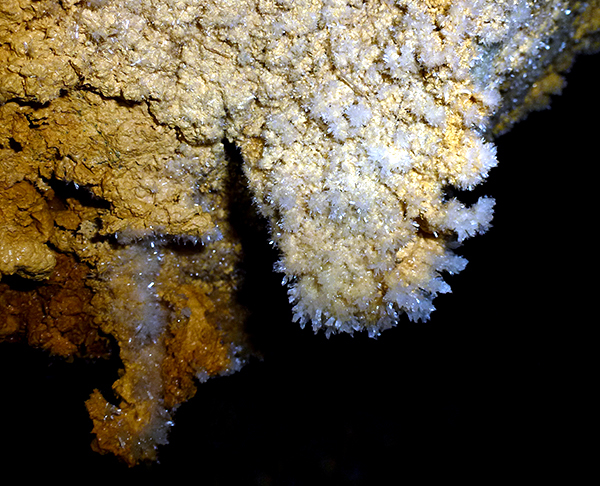 Minerals from the halotrichite group on the tunnel`s ceiling, upper level of the Breiner Mine. P. Żochowski photo. 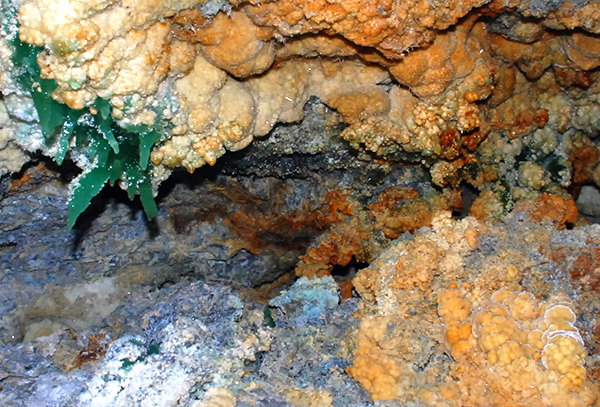 Gypsum in situ, upper level of the Breiner Mine. P. Żochowski photo. 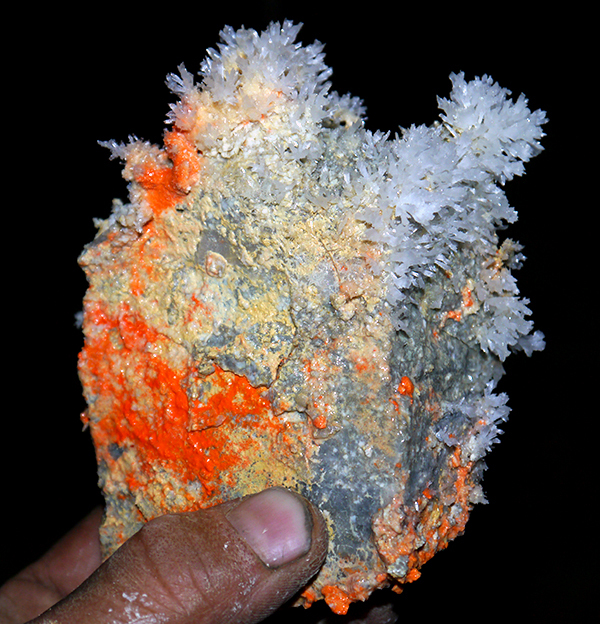 Gypsum on matrix with realgar, upper level of the Breiner Mine. 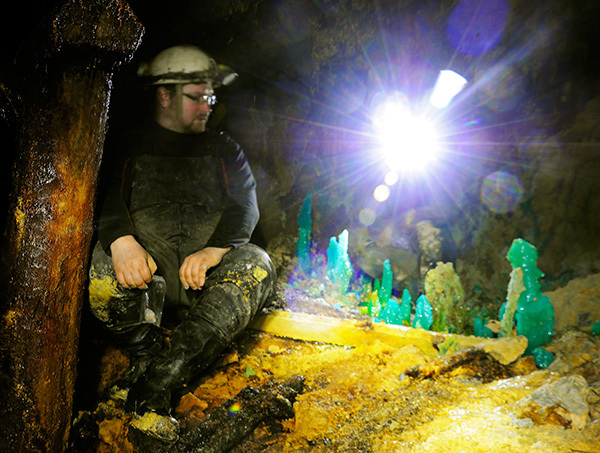 K. Dembicz photo. 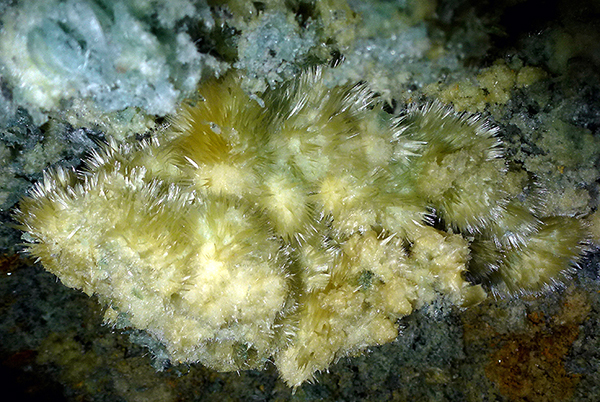 Freshly collected specimens, mostly from the halotrichite group, very difficoult to pack and transport without damaging them. P. Żochowski photo. Almost on the surface! K. Trela photo. 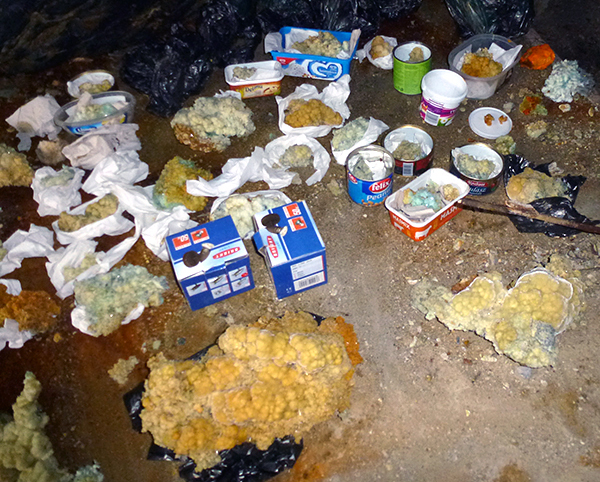 Repacking specimens brought from the undergorund. 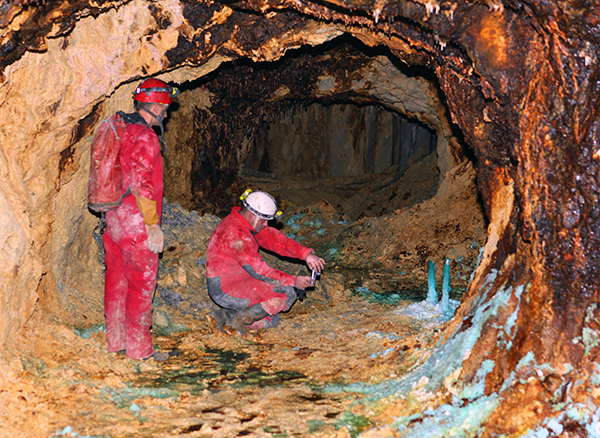 K. Kołodziejska photo. 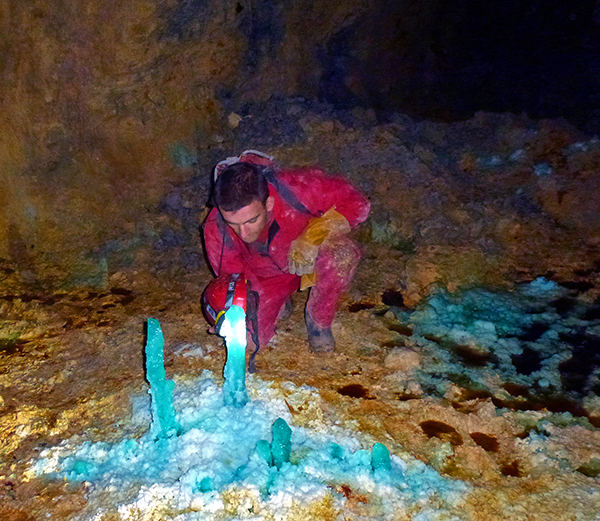 Gypsum specimen safely transported to the surface. 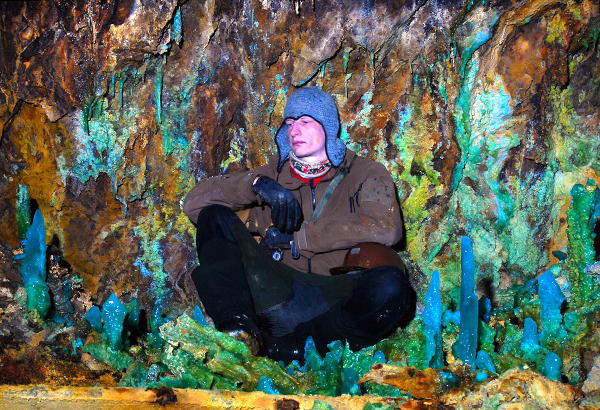 K. Dembicz photo.